Deepcool was founded in 1996 with its headquarters in Beijing with the focus on providing best and personalized thermal solutions for the customers around the world. When it comes to the enthusiast grade PC components, Deepcool is a well-established and recognized brand which is gaining more popularity. The company is focused on providing better thermal solutions in the form of the air and liquid coolers. 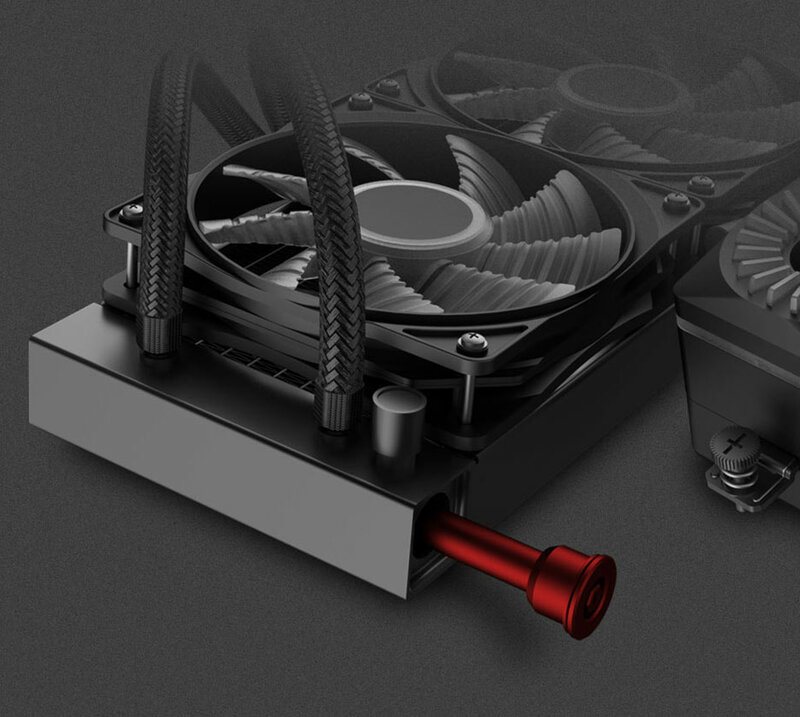 Their Captain Ex is a high-end AIO CPU Cooler that has form and function in a single package. 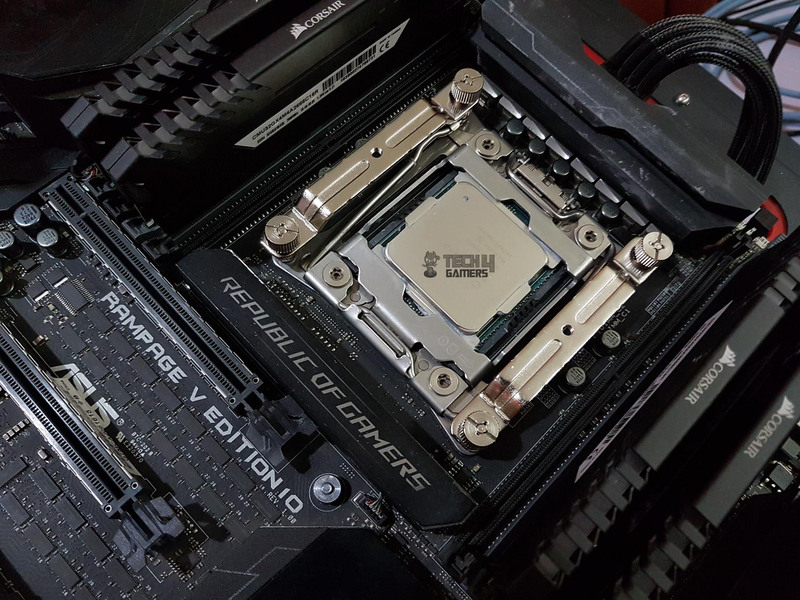 Deepcool has seen more success with their Castle and Fryzen CPU Coolers and they are catching up with the trend for sure. The company is offering PC Chassis, Power supplies, Case Fans, Laptop Coolers, desks for PC, Lighting solution. Gamer Storm is the brand of Deepcool under which enthusiast grade PC Components are offered to the market. Tri-Stellar, Quad-Stellar, Genome/II, New Ark 90 are some of their popular and highly customizable PC Chassis in the market. 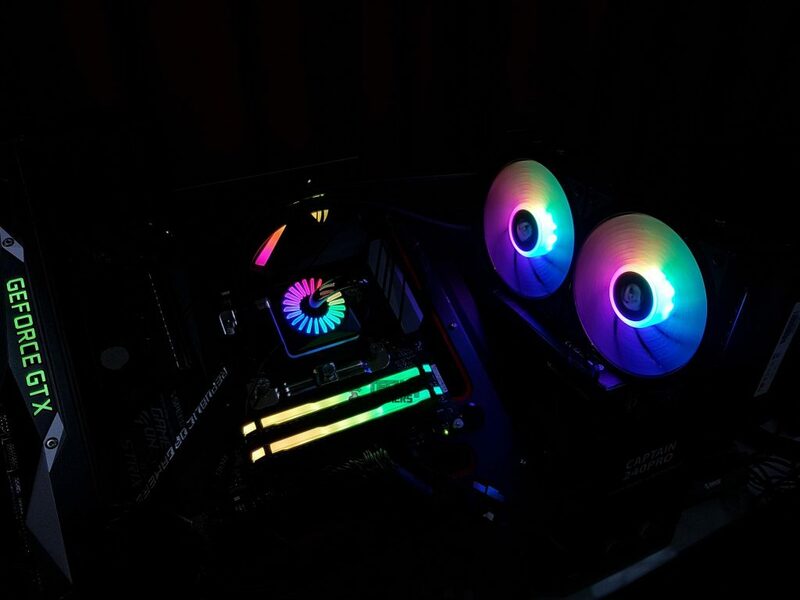 ADD RGB on both optimized pump LEDs and CF fans, offering users almost unlimited lighting ambiances. The RGB lighting system is controllable through both the included controller and specified motherboard. A 6-port RGB hub is included to make your RGB syncing easier. Pump powered by a three-phase winding motor provides a continuous driving force. 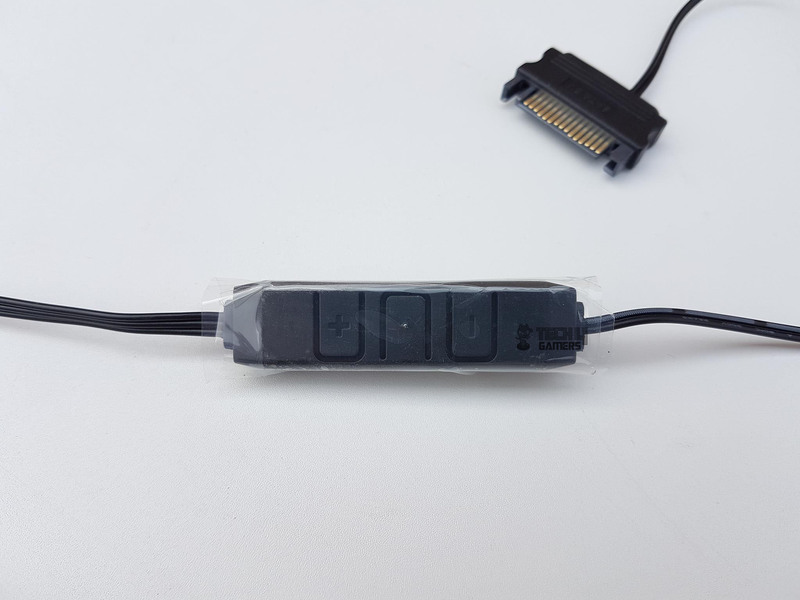 WS2812B ADD-RGB LED is applied and the below 3pin ADD-RGB Headers are compatible for this device: 5V/D/G and 5V/D/NC/G. 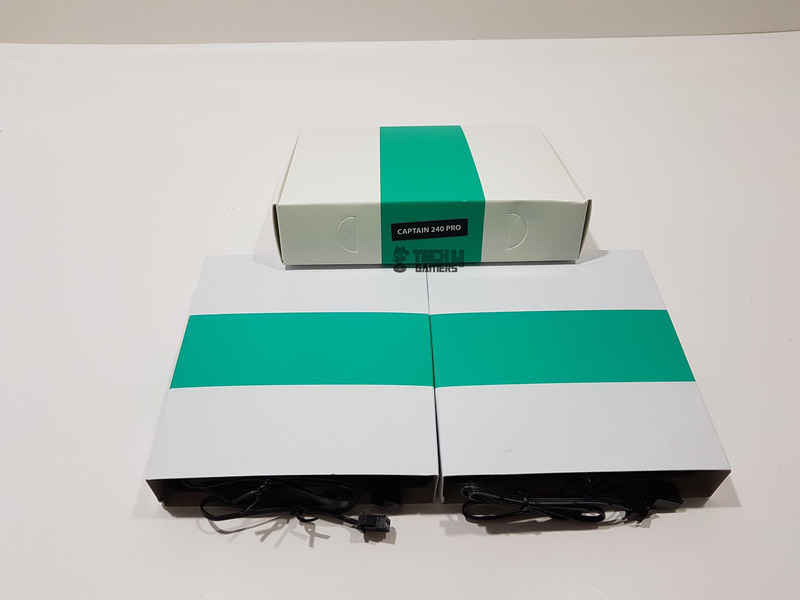 The packing style and theme are the same what we saw on their Castle 240 and lately, they have been following the black/green colored packing boxes. The cooler is shipped inside a cardboard box. The front side has GamerStorm brand name and logo printed on the top left. The compatibility information with various motherboards’ lighting solution is printed on the top right. There is a colorful picture of the cooler on the main section showcasing the main features of the cooler. 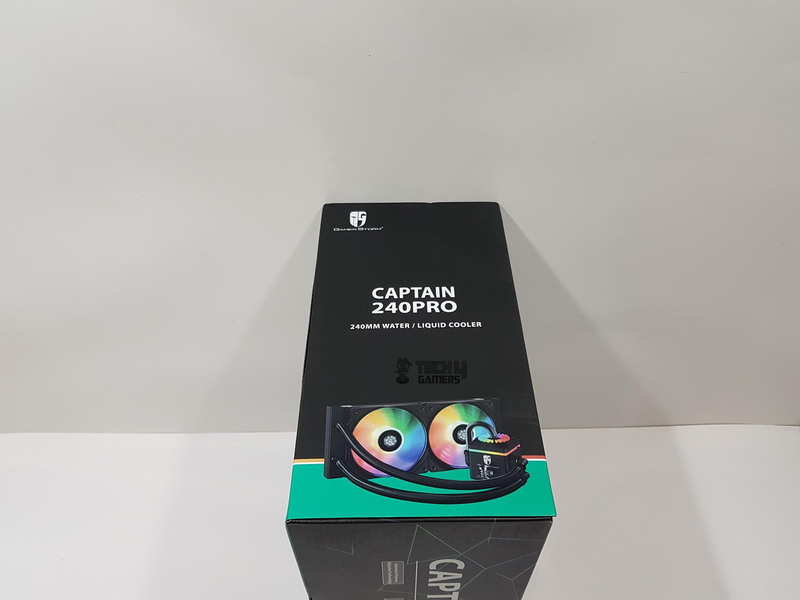 Captain 240 Pro is printed at the bottom. 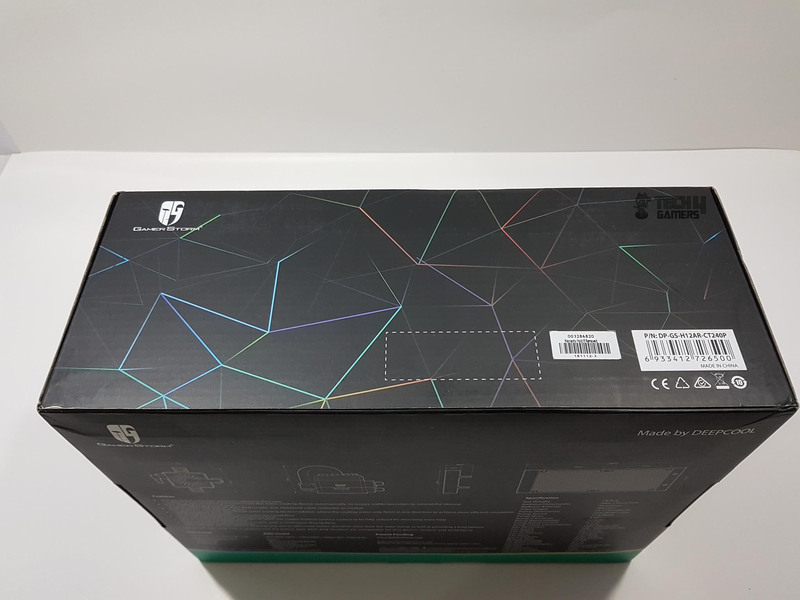 The backside of the box has block diagrams on the top showing the dimension of the product. Salient features are printed in bullet format followed by the specifications on the right side. The compatibility information with the sockets is printed at the bottom. This side has the GamerStorm brand name and logo printed on the top left. The part no sticker is printed at the bottom right. 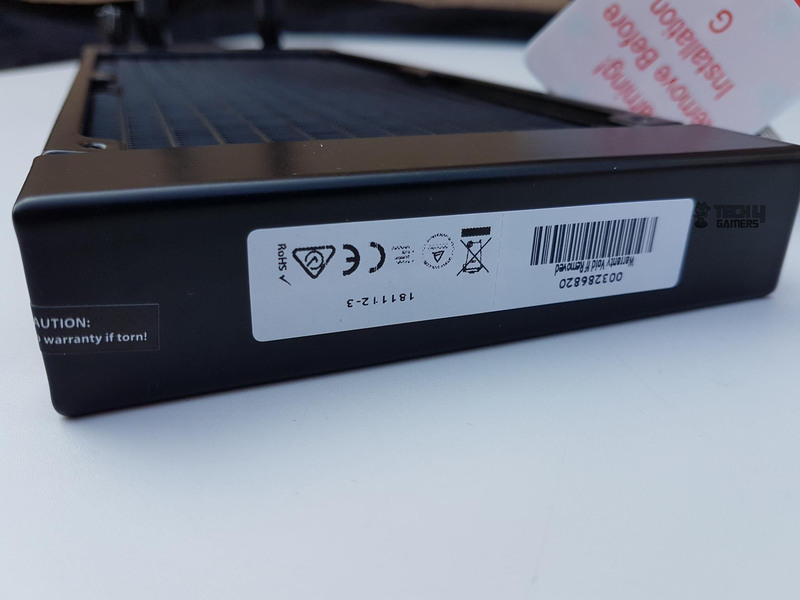 There is a small size sticker pasted before the part no sticker and it says, warranty void if removed which took me by surprise. 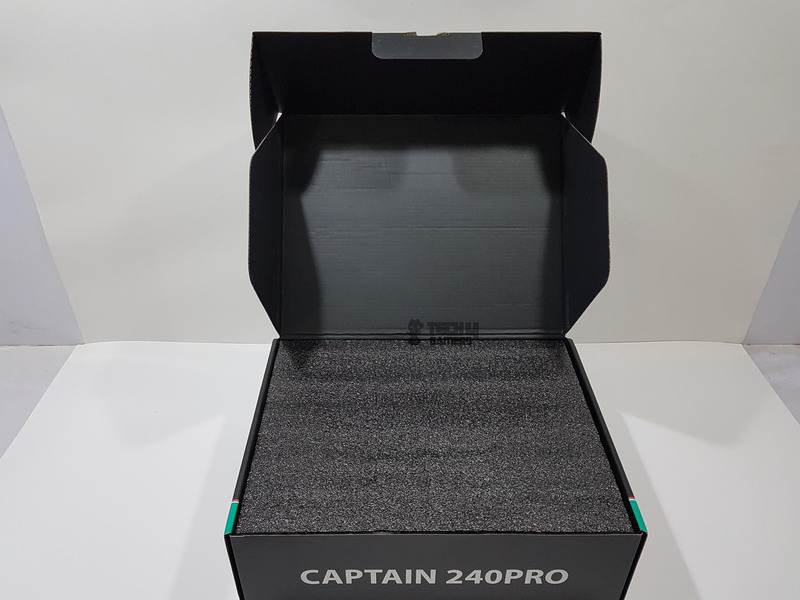 The box opening side has Captain 240 Pro printed in the center in the white color font. Salient features are printed in the 4 boxes below the model. 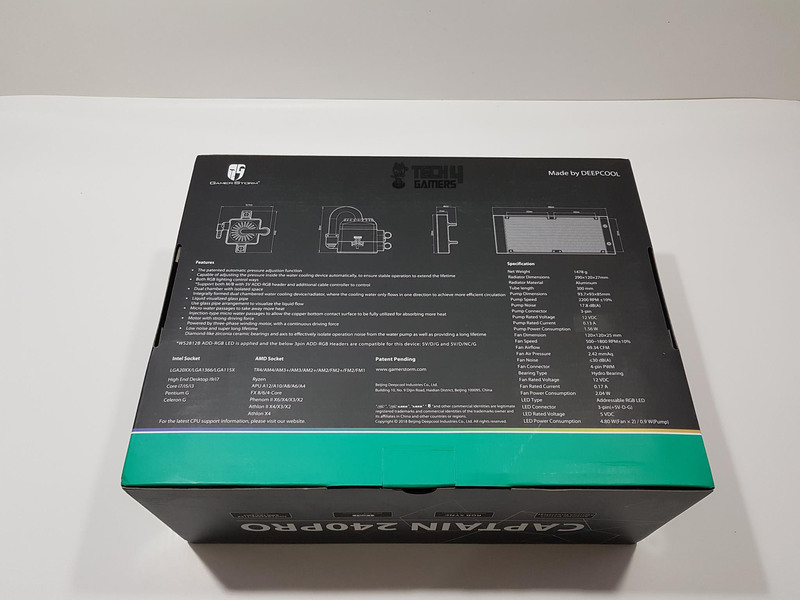 The left side of the box has a GamerStorm brand name and logo printed on the top left. 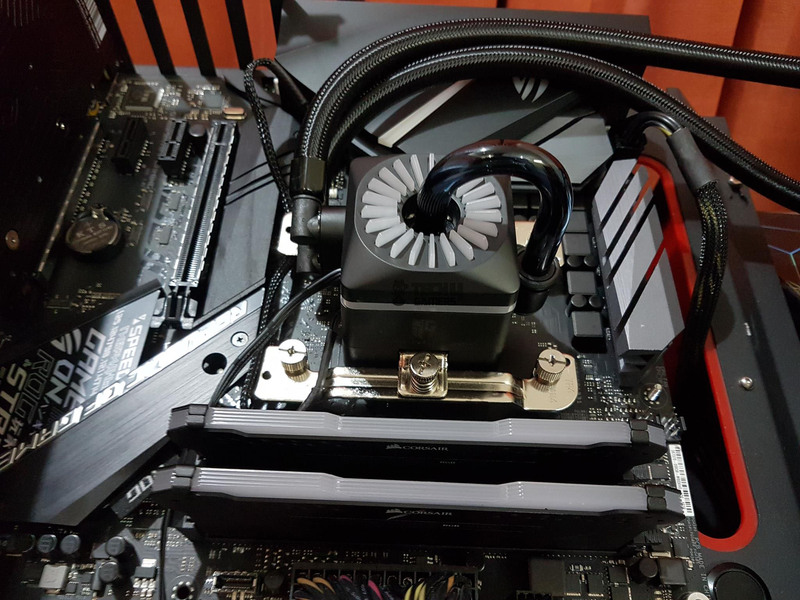 Captain 240 Pro is printed in the center followed by the 240mm Water/Liquid Cooler. I have a suggestion here for Deepcool. 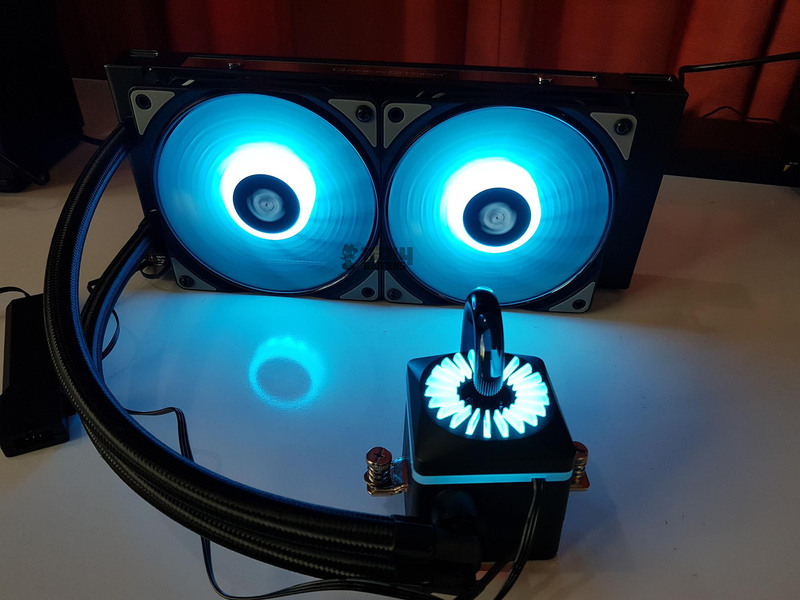 Instead of writing water cooler just say liquid cooler. There is a colorful picture of the unit at the bottom. This side has GamerStorm brand name and logo are printed on the top left. 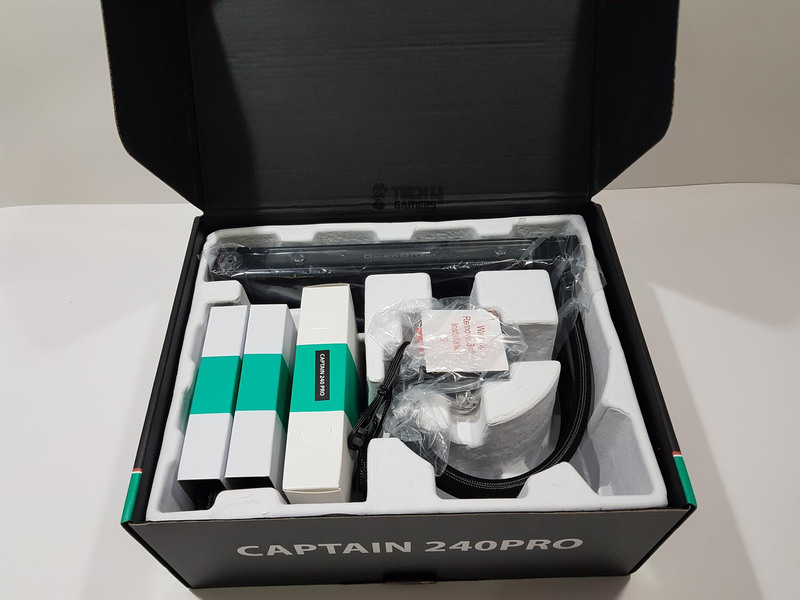 Captain 240 Pro is printed in the center. Salient feature highlights are printed at the bottom. Opening the box will show a black color Styrofoam pad on the top of the contents. Removing it will show the nicely packed stuff inside an egged carton. The radiator is made of aluminum hence it is lightweight. 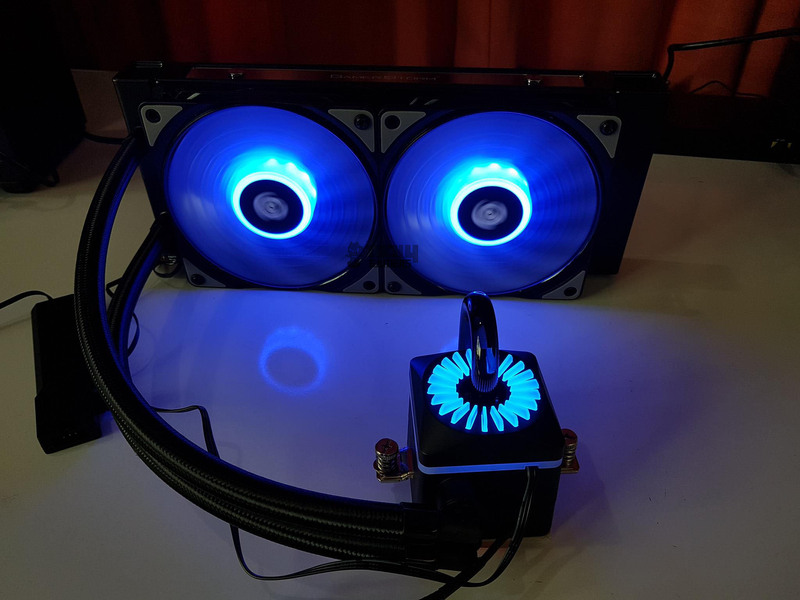 This is Deepcool’s own design. The blocks on both ends of the radiator are rectangular and have straight edges. Fin stack is dense and taking into account the left and right side channels, it has a total of 12 channels for water flow. It is following the double tunnel configuration. It has a standard inlet and outlet blocks for the water flow. There are no protective sheets over the fins under the fan mounts. So, take care while mounting the fans as longer screws could damage the fins which would hamper the performance of the cooler. It is recommended to use the supplied long screws to mount the fans on to the radiators. There is a gap of 105mm between any two fan mounting holes on the radiator. The backside of the radiator has an identical layout on the fin stack as is on the front or top side. Another striking feature is the finishing of the radiator sides. We have a premium touch here. 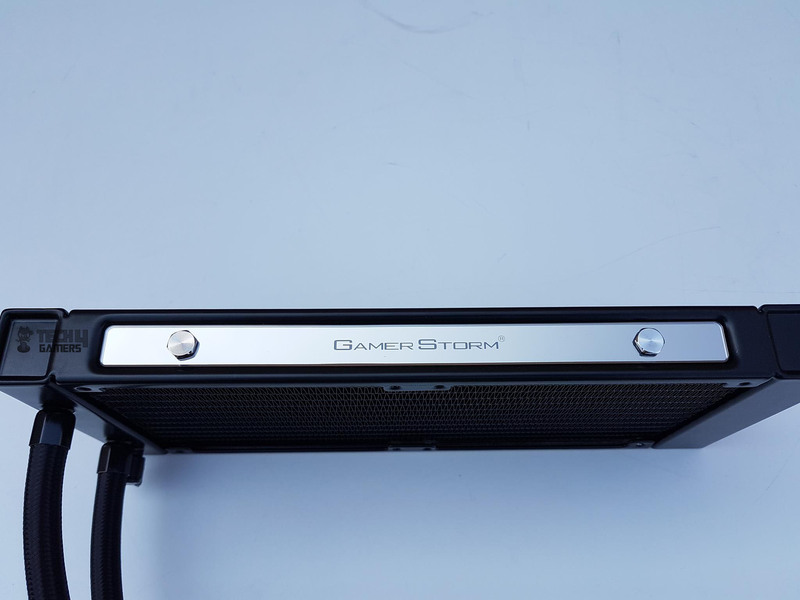 GamerStorm brand name is printed on the plexiglass and screwed on the radiator using aluminum screws. The final product is mind-blowing in terms of the look and feel. 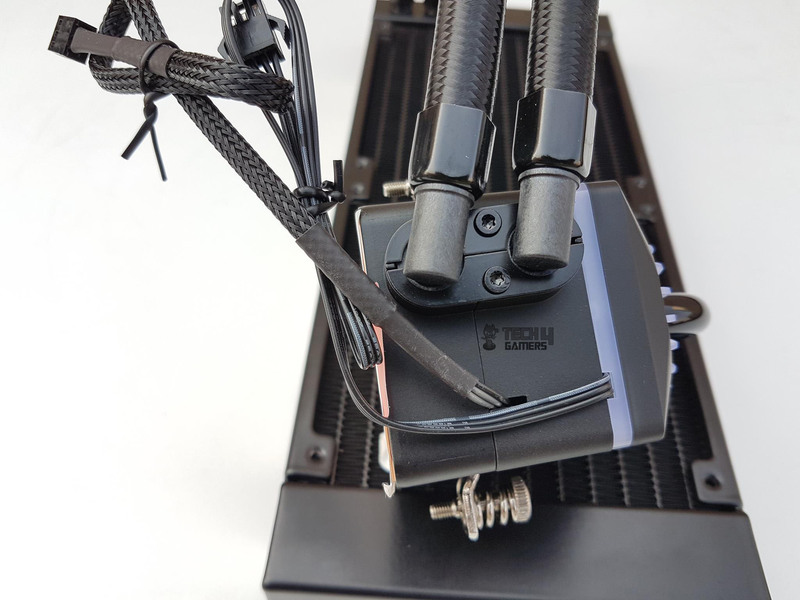 Unlike many other AIOs in the market, the hoses are clamped inside rugged looking clamps on the radiator as barbs are hidden inside these clamps. There is a refill port on the radiator. Surprisingly, it has a Warranty Void sticker pasted on it. Refill port helps the users to refill the coolant should its level drop affecting the performance of the cooler. The above picture shows the automatic pressure release valve or port. 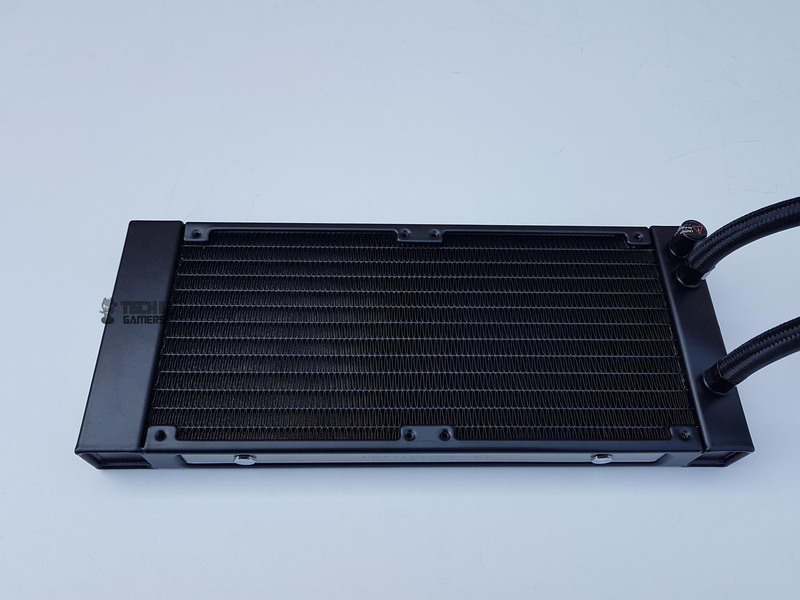 The Deepcool has named the radiator as Automatic Pressure Relieving Radiator. The main concern with the AIOs in the minds of the users is and has been the leakage fear which could literally fry their expensive systems. Leakage could occur due to multiple factors like pressure buildup inside the loop that would ultimately break through the fitting or poorly clamped fitting/hose etc. 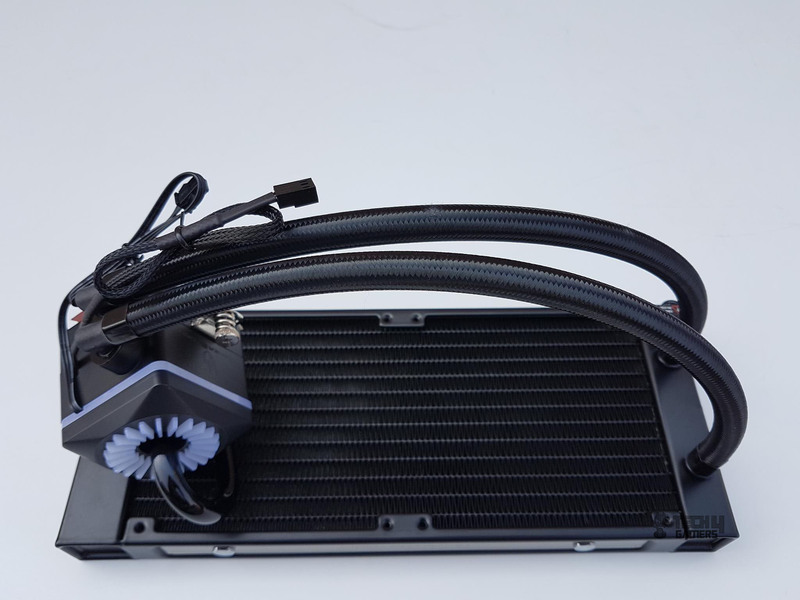 Deepcool has given a thought to it and it took their R&D department 3 years to come up with the solution of preventing leak due to internal pressure in the AIOs. They have come up with the solution in which they have integrated the pressure release system in the radiator. It is designed to be a part of the radiator sitting in the flow of the loop on the outflow port. Any pressure inside the loop will find its way out through this valve in the air. So, we have one major concern addressed here. The above picture shows the block diagrams of the typical or standard AIO on the right side and the Anti-Leak enabled on the left side. 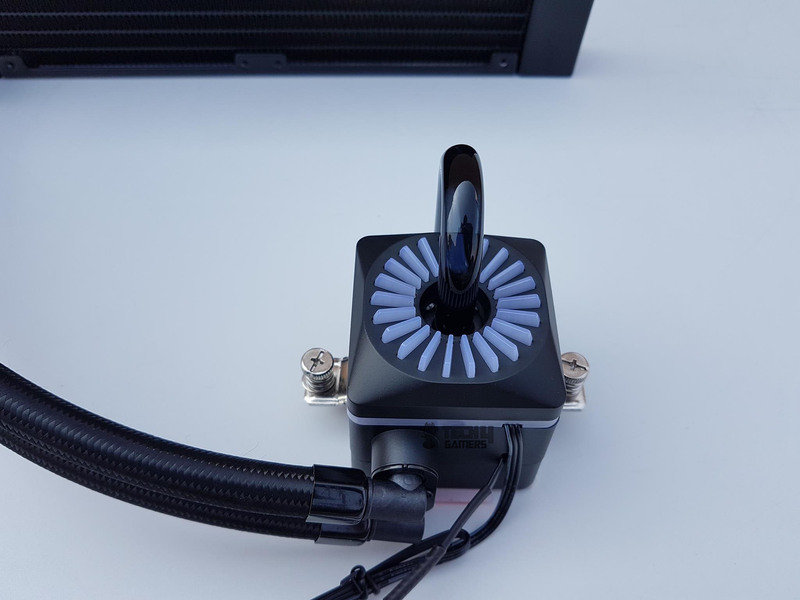 Deepcool has installed an elastic based pressure-released bag on the outlet side of the radiator. One side of this bag is dipped in the coolant whereas the other side is exposed to the air. When the internal pressure reached the atmospheric pressure or exceeds it the bag will be squeezed. This would increase the internal volume of the loop and would cause the increased pressure to be released in the air through the valve. This would reduce the risk of the leakage in the AIO owing to the increased internal pressure. The anti-leak AIO is a new concept of its type and if proven successful it will be the next big thing in the AIO design. 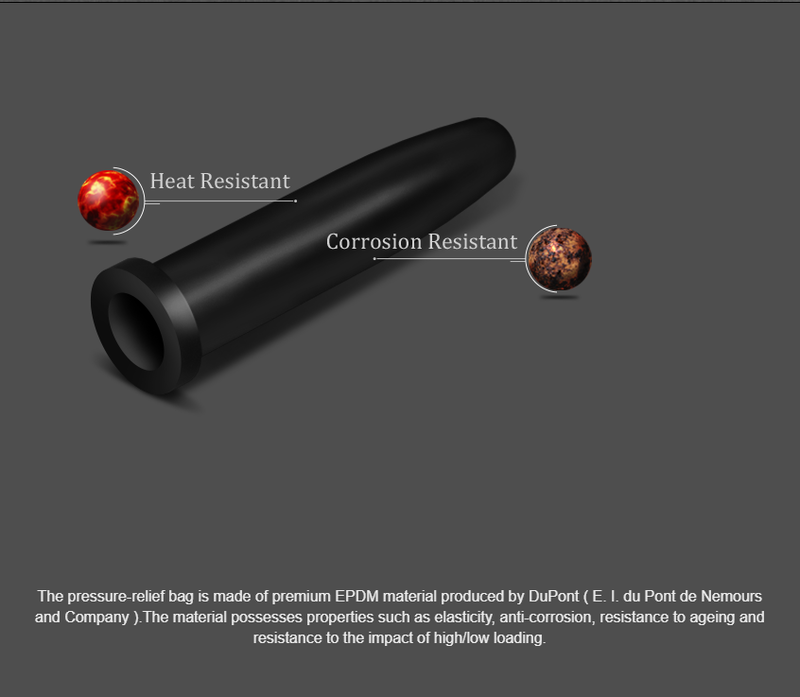 the press-relief bag is made of the premium EPDM material produced by DuPont with properties like elasticity, anti-corrosion, heat resistant. So far, everything looks good on the paper. 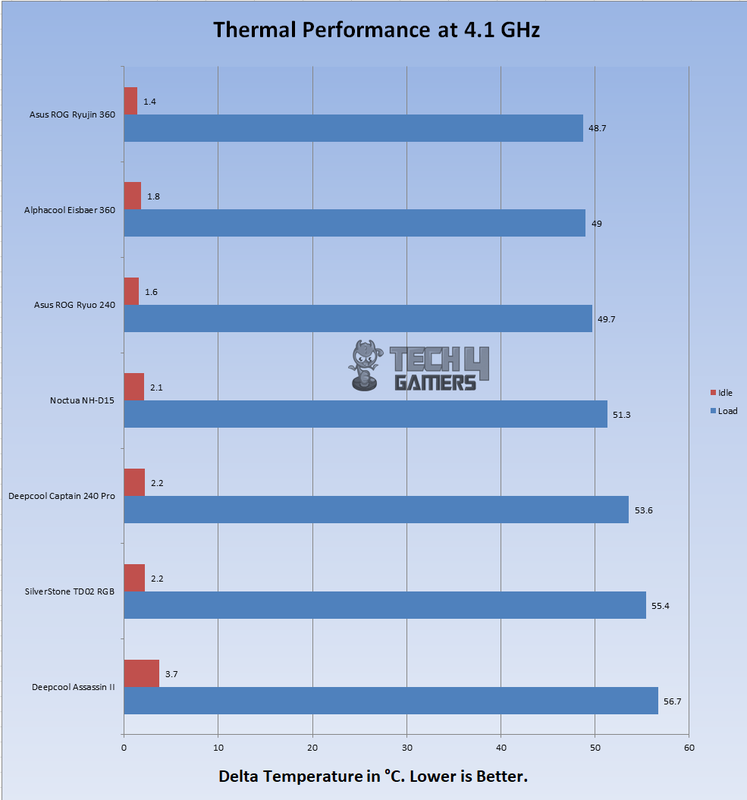 Only the long term testing would tell the tale but it is for sure that Deepcool has given the users where others have not yet. The above picture shows some graphs from Deepcool internal testing where they are showing the advantages of using anti-leak cooler over the time of period when the coolant’s temperature increases it increases the volume of the loop hence the non anti-leak coolers are more at the risk of leakage due to pressure buildup. There is a sticker pasted on the far head or chamber of the radiator. Surprisingly, even it has warranty void if removed sticker pasted on it. So, we have by now four of these stickers. One is pasted on the packing box, three are on the radiator alone. The hoses are firmly fitted on the radiator assembly and on the pump housing. The soft tubing is made from upgraded anti-explosion rubber tube manufactured using an anti-corrosion, crush resistant and thermostable material. The soft material tubing is a bit flexible and doesn’t produce kinking which is always a plus. Deepcool is using mesh sleeve on the hoses to give them a clean look. The length of the hoses is approximately 300mm which is less than what I had expected. Let’s take a look at the main element of this cooler. 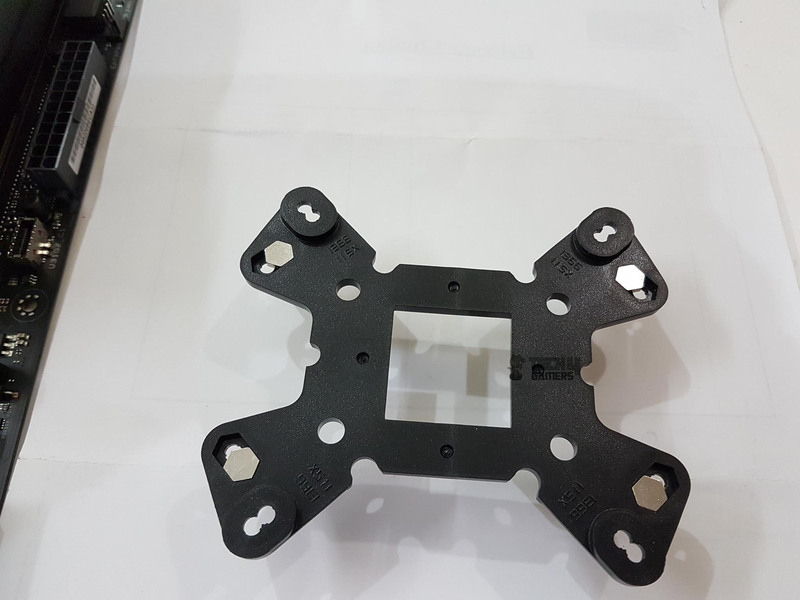 It is the water block with the pump housing. 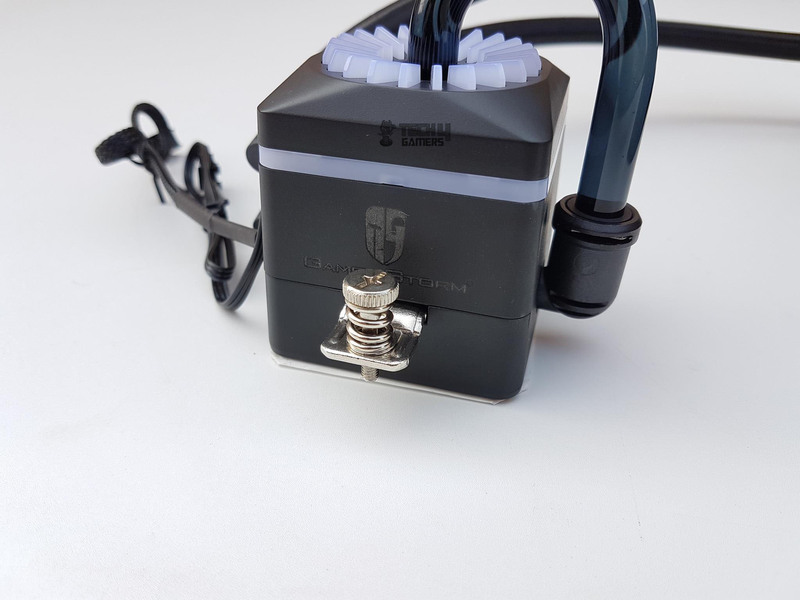 I have seen CLCs with a simple design where only the pump is on the block which reduces the weight of the block and adds more simplicity to the designs. Then there are integrated reservoirs on top of the pump housing which not only adds more to the looks particularly with the lighting enabled reservoirs but also brings in more coolant capacity. They have what I would like to term as Arc Reactor for it does resemble the reactor, unique reactor style pump housing giving the overall looks of the block to insanely awesome steampunk appearance. It does look that well in person. The dimension of the block is 93.7mm X 93mm X 85mm (L X W X H). The block size is relatively larger as compared to other CLCs in the market but definitely, a small footprint when compared with the Reeven’s Naia 240 and Aerocool’s L240. The block has a single piece of the diffuser which is cut to the design. It has a solid base of approximately 4-5mm thick which is visible on the 4 sides of the block whereas its top surface with 22 cutouts protrudes out of the top lid. They are in a rounded circular manner. The center of the top lid has a glass tube coming out of it. The overall design immediately jogs your memories about the arc reactor of some sort and Deepcool has successfully designed it to be. 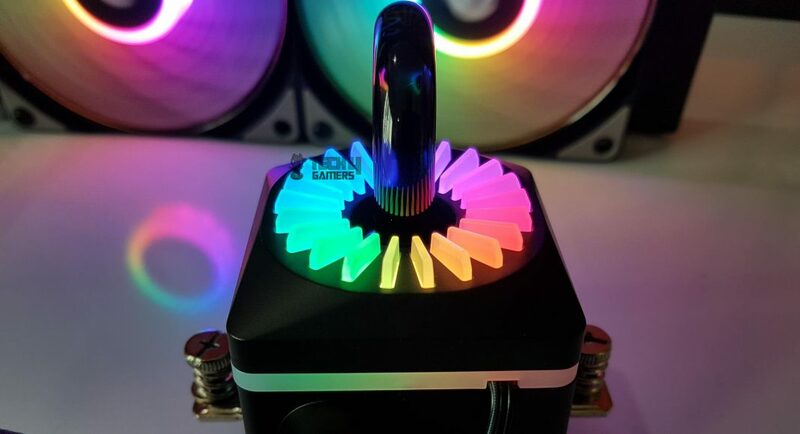 What is different is that these diffusers have addressable RGB LEDs underneath to create one heck of stunning and dope looks. This is another area where the design is different from the Captain 240 Ex RGB. The glass pipe is used to bring the coolant from the bottom chamber to the upper chamber. This design circumvents the Asetek patent. Looking at the block would give you an idea of two-chambered design. Looking at what should be the rear side of the block, we can see the 90° barb fittings which can be somewhat rotatable. There are two cables coming out from this side. The top cable is the LED one measuring a length of 275mm. Believe me, this is a much shorter length than what it should have been. It is coming out from the top side where the second LED zone is located. We have a solid diffuser running across the entire length of the block’s housing. The LED cable is flat. The second cable is coming from the mid where the actual pump is located at. It is nicely sleeved and has a length of 262mm. The left and right sides of the block has GamerStorm printed in the middle. 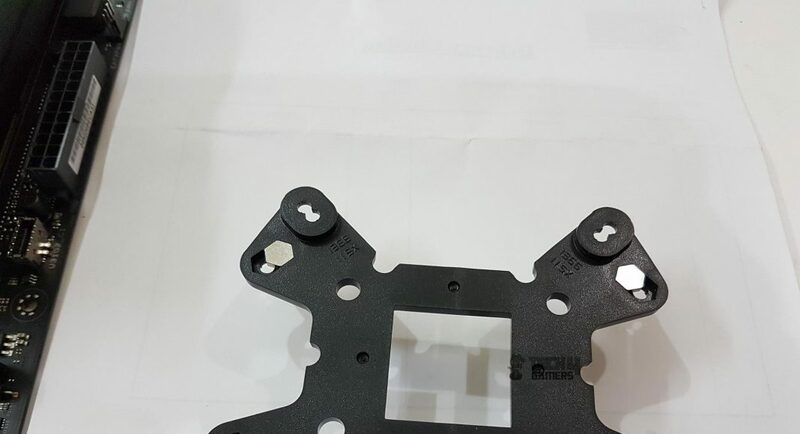 The mounting bracket or plate is pre-installed and it is a part of the block. It has two spring-loaded screws on each end to secure the block on the mounting assembly. I am a bit skeptical of using only two sides mounting pressure to install the cooler. Only testing will confirm if we have some performance hit or not. We have a copper base on the block measuring 53x53mm. We have a total of 8 hex screws securing the copper base to the block’s housing. 53×53 is quite a size and base is not mirror polished finish. A white color protective sheet is pasted on the base cautioning the user to remove it before installation. The Deepcool is using the closed impellers driven by three phase induction motor to deliver strong liquid flow. Deepcool is using Zirconia Ceramic bearings which are diamond-quality bearings which isolate the noise from the pump as well a longer lifetime. How much longer? Not mentioned in the specifications or the literature. Thanks to dual chamber design, the liquid flows in one direction to achieve circulation efficiency. Injection type microchannels for the water allows for maximum copper surface utilization for better heat conduction. The Pump speed is rated at 2200±10% RPM at 17.3 dB(A) rated sound level using 12VDC at 0.13A rated current and 1.56W power consumption. 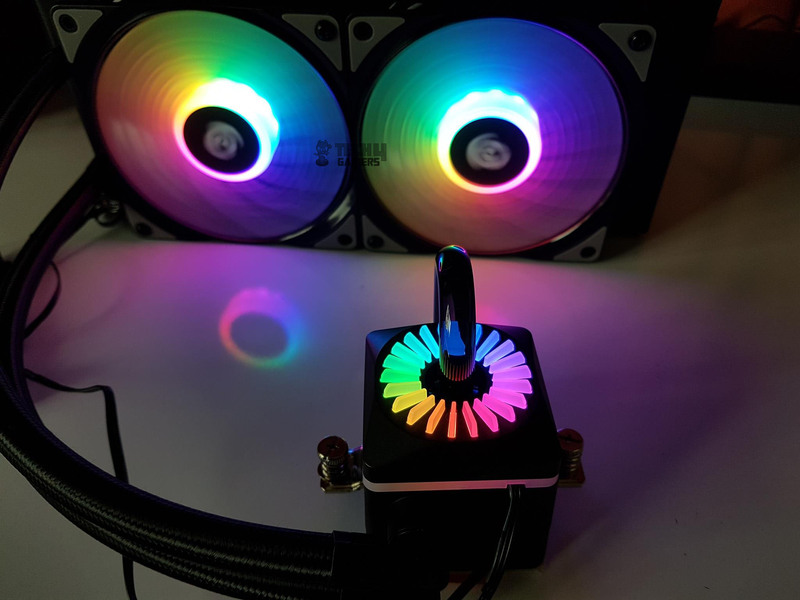 Deepcool has bundled two CF120 addressable RGB fans with this cooler. These are the enhanced version of the original CF120s with specs tuned for better performance on the radiator as original CF120s are optimized for chassis airflow. I have already done a detailed review of these which can be checked by clicking here. Each fan has 9 translucent blades with dedicated air channels on each blade. 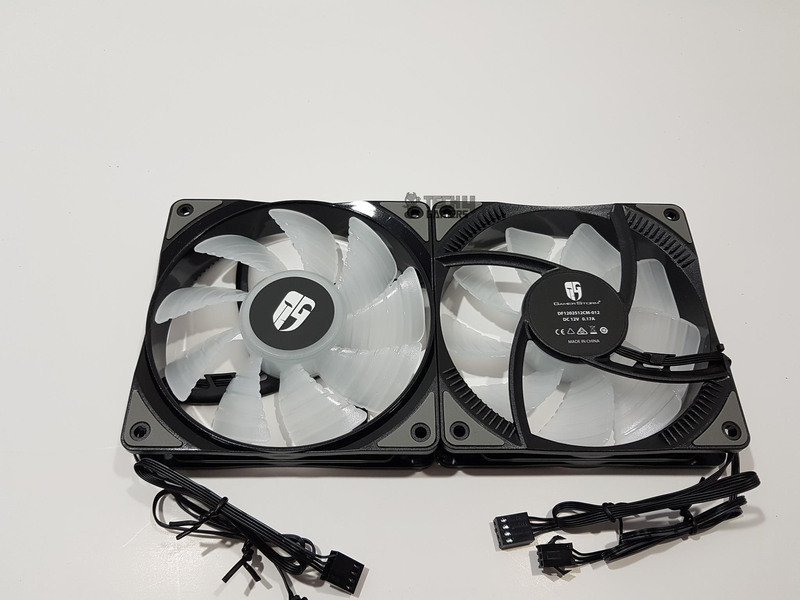 There is a GamerStorm brand logo sticker in the middle of the fans. Each fan has anti-vibration gray color pads on the mounting corners on both sides. The frame has a shiny black color frame on the upper side. Looking closely one can see the main design being circular around the blades and four mounting sides on this circle. The backside of the fans has an almost similar design as we saw on the TF120 fans that we reviewed earlier. There are air-forming channels on the edges of the frame. We have 4-arms assembly holding and securing the impellers to the frame. There is a black color sticker on the motor hub with GamerStorm brand logo and name on the top. Fans are made in China. 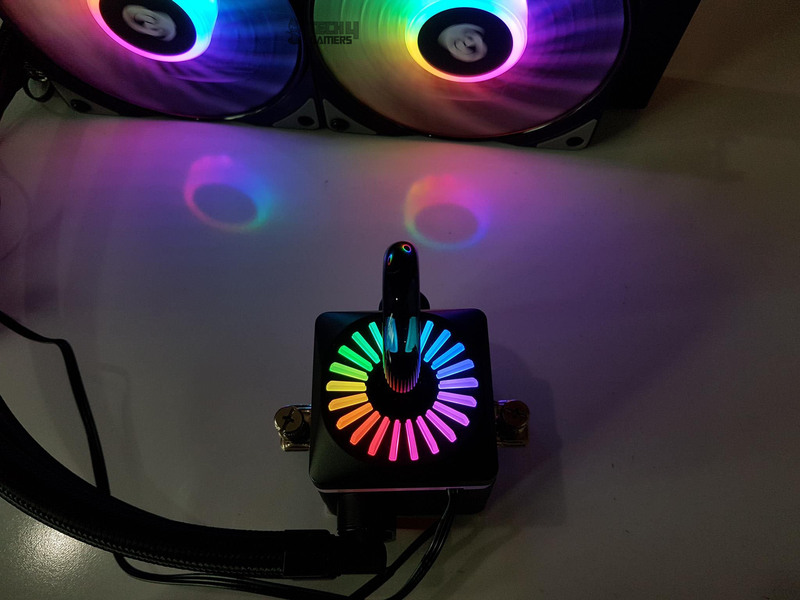 Each fan has 12 RGB LEDs inside the motor hub. These fans are rated at 12VDC with a rated current of 0.17±10%A with the power of 2.04W. The fan speed at 12VDC is 500±200 ~ 1800±10% RPM. Maximum airflow on 12VDC is 69.34CFM. The noise level is 17.8-30 dB(A). Maximum static pressure is 2.24mmH₂O. 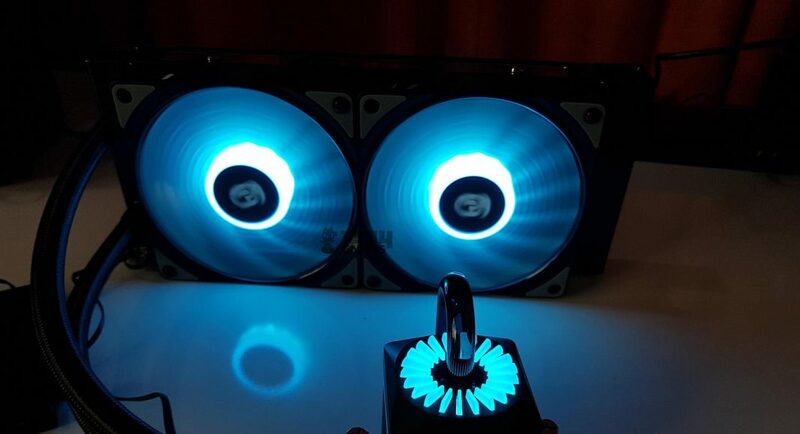 The fans are using the Hydro Bearings with MTBF of 40,000 hrs. There are two cables per fan. One is a 4-pin power cable with a length of approximately 280mm and it is flat. The second one is a 3-pin flat LED cable with a length of approximately 385mm. 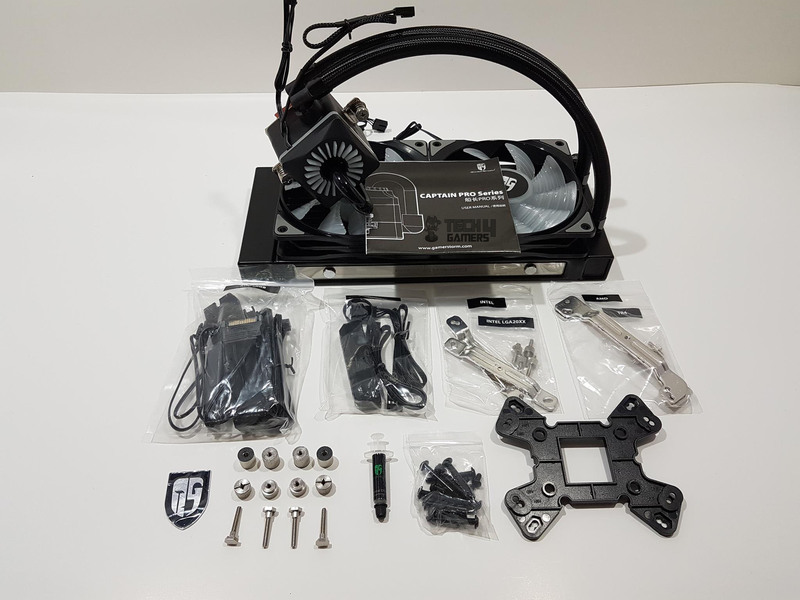 The Deepcool has enclosed a 4-port fan hub in the parcel which is really good on their part. 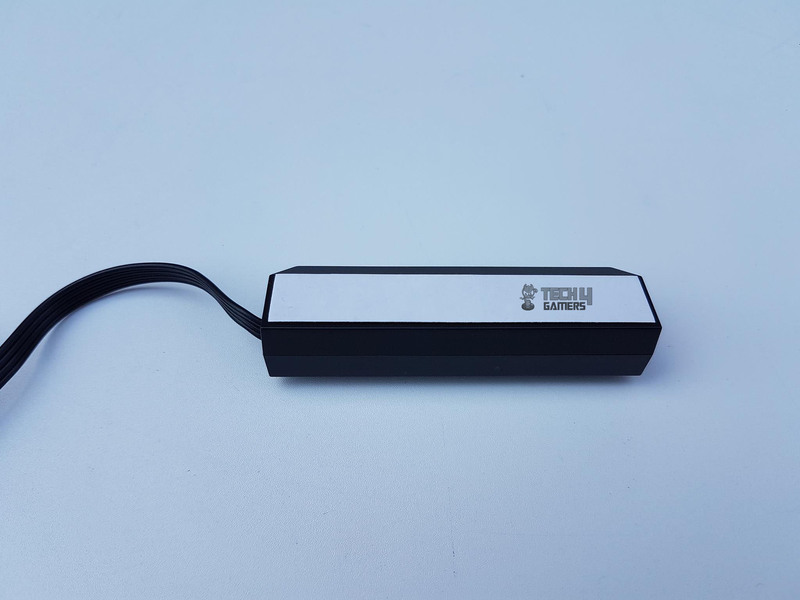 This is a revamped version of the fan hub which is sleek and slim in design and looks that good in person. The ports are numbered as Fan 1 to Fan 4. GamerStorm is carved on the opposite side of the port numbering side. The other side of the hub has a 3M adhesive tape to easily install the fan in the chassis. 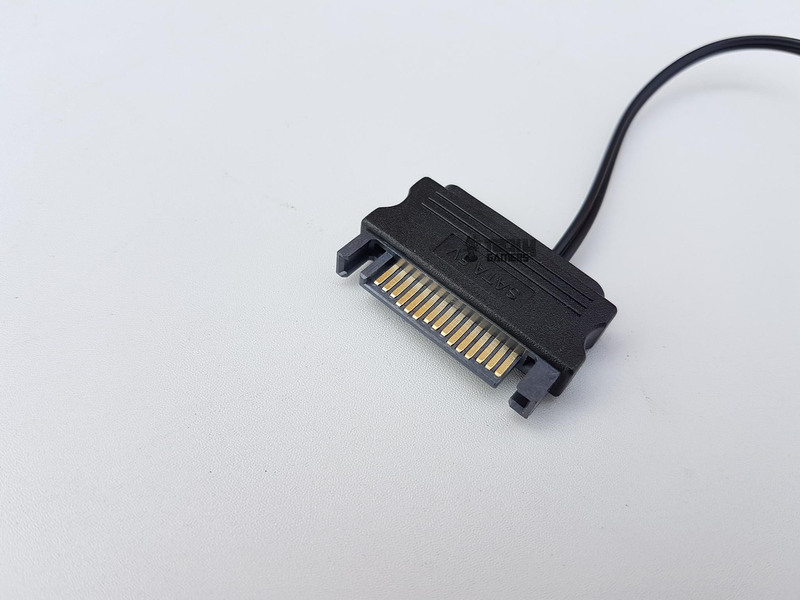 The hub has a 4-pin PWM cable measuring 392mm. They have also bundled a 4-pin PWM extension cable just in case. That cable has a length of 400mm. 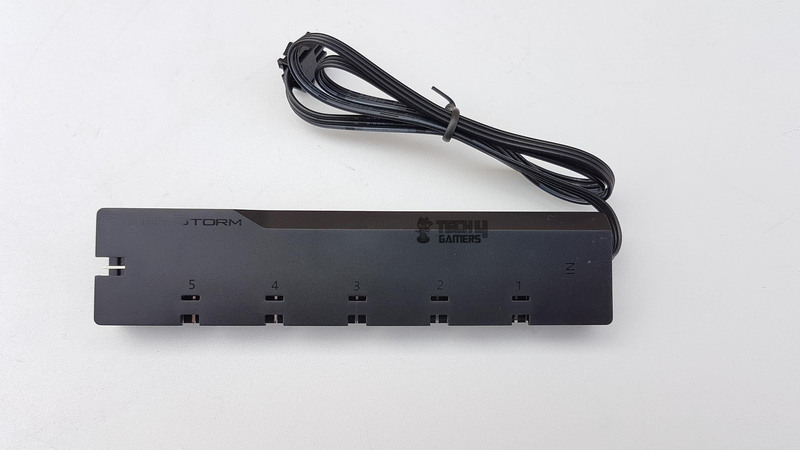 Should a user wants to go push/pull setup on this unit, the 4-port fan hub will come handy as it will allow all the four fans to be connected to this hub and then a single 4-pin PWM cable coming out of this hub can be connected to the motherboard’s fan header for speed regulation. This way we can be sure of having the same speed on all the fans. 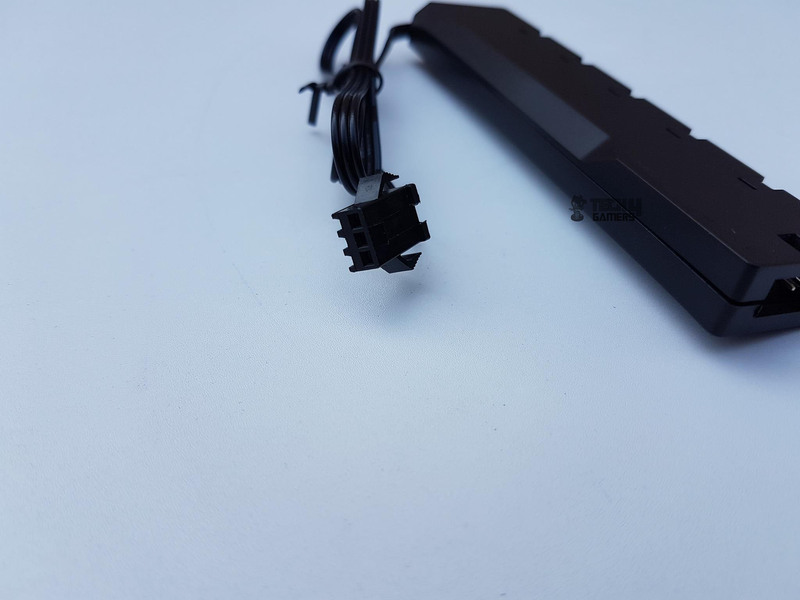 The port one is in white color to indicate that PWM signal from this will be used to regulate all the connected fans. 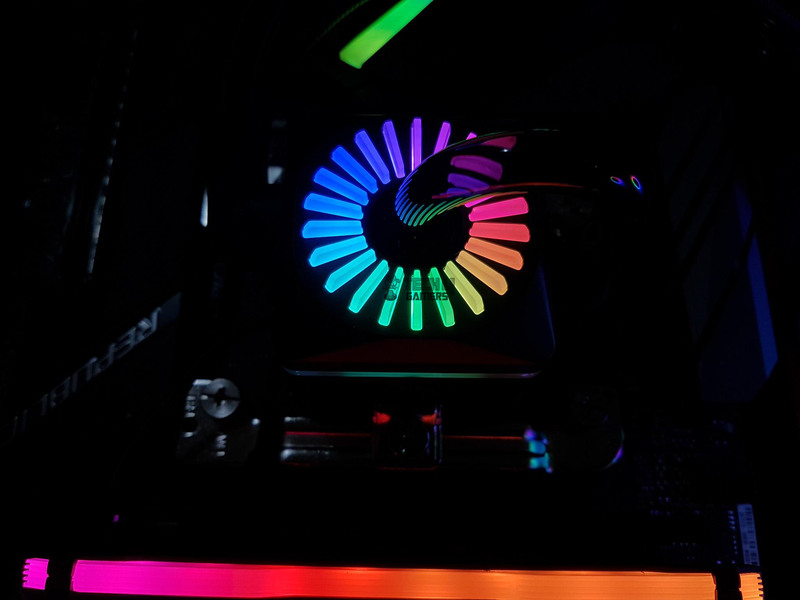 Now, it is time to take a look at the RGB lighting hardware that the Deepcool has provided with the unit. The 16.7M true color RGB flowing light system with 5 in-built effects (dynamic, static, breathing, comet, and fashion collision) has 36 interchangeable lighting modes are on this cooler. 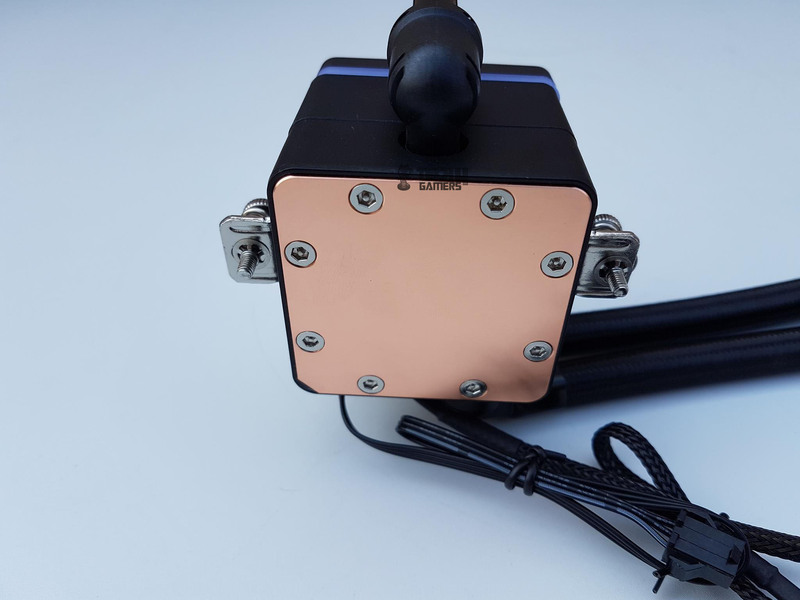 As we have discussed above that addressable RGB LEDs are in the top portion of the block under the diffuser for which there is a 3-pin cable coming out of the pump housing. 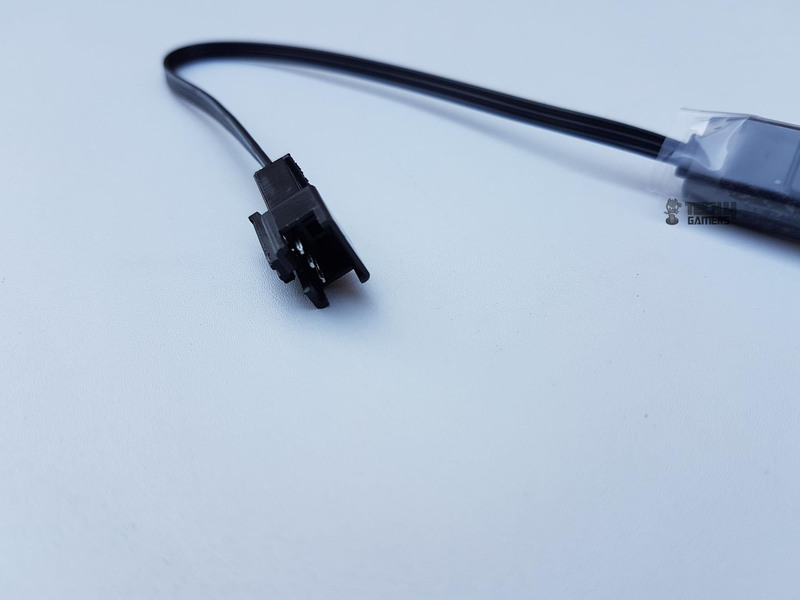 Due to the format of this cable, it can’t be connected directly on to the motherboard’s addressable RGB header. Deepcool has provided two solutions for that. One is the dedicated controller to control the addressable RGB lighting effects. 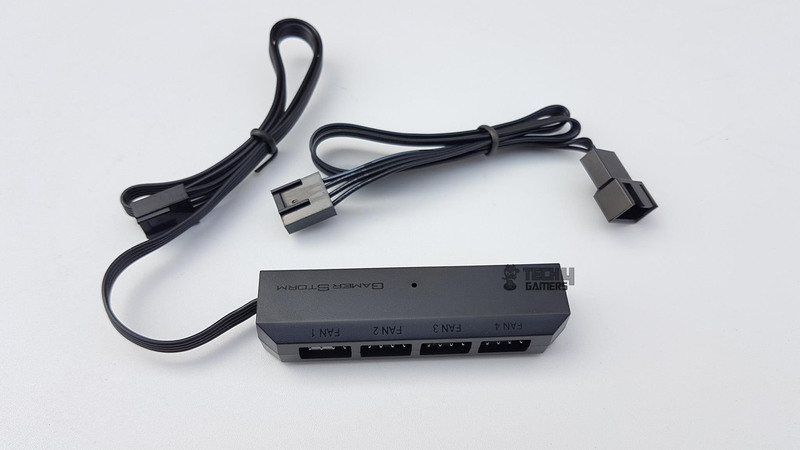 The controller is SATA powered. The length of the power cable is 400mm whereas the length of RGB cable is 370mm. The controller has 3 buttons on the top side of it. The top button has + printed on it and it is used to switch between different lighting modes. It has a toggle effect. The middle button is used to control the brightness. It will speed up/down the speed of the currently loaded mode and does not work on the static mode. The bottom button has – printed on it and it is used to switch load the previous mode. There is one caveat that I can mention here when it comes to mounting this controller. Ideally, I would want it to be readily accessible to me so it should be available outside of the chassis which is definitely going to be an issue. 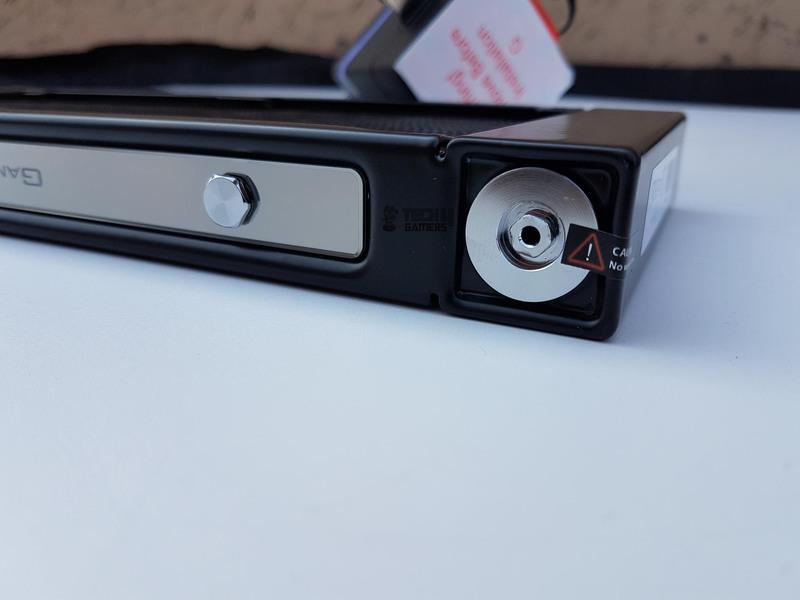 Alternatively, it can be installed in a place inside the chassis where accessibility can be of ease but for that, we still will have to open the side panel to access the controller. 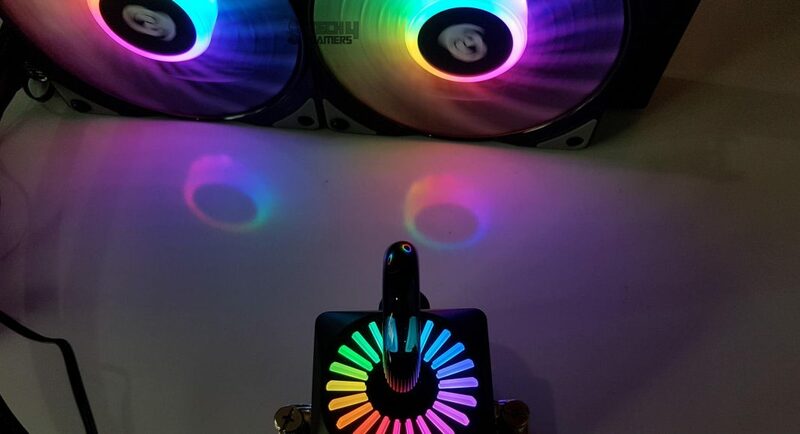 This is not all as Deepcool has also bundled RGB LED hub which allows for up to 5 ARGB devices to be synced and color coordinated. That hub can be connected to the controller be it a dedicated one or the motherboard’s lighting header. It has two magnets on the back side to easily install it inside the metallic chassis. There is also 3M adhesive in case it is to be used on a non-metallic surface. Here are some pictures for your eye pleasure and we have made a video on the lighting effects. 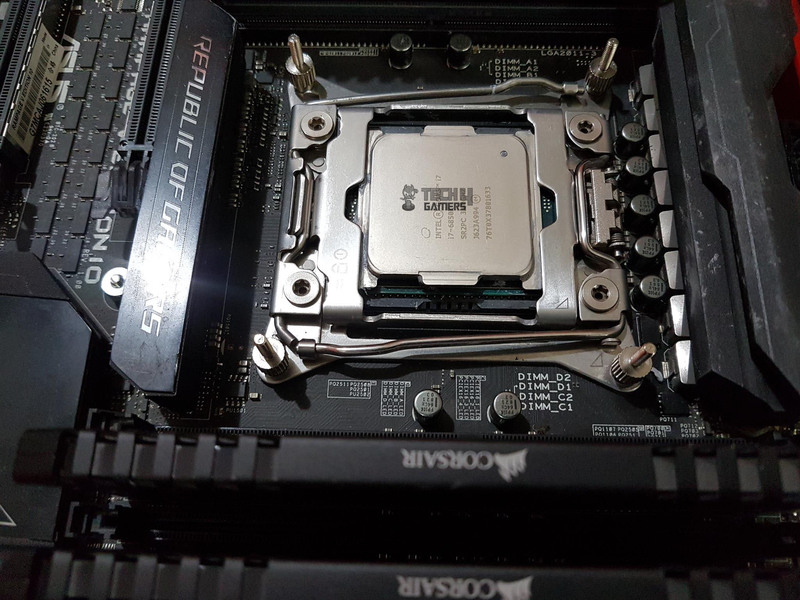 Install the LGA20XX bolts on the pre-drilled holes around the CPU socket. Place the Intel mounting brackets on these bolts. I would advise to place them horizontally (looking at the motherboard from the standing position). Secure the mounting brackets using the Nuts A (small size nuts). Install the fans on the radiator. Apply the thermal paste on the CPU. Remove the safety sticker from the base of the cooler. 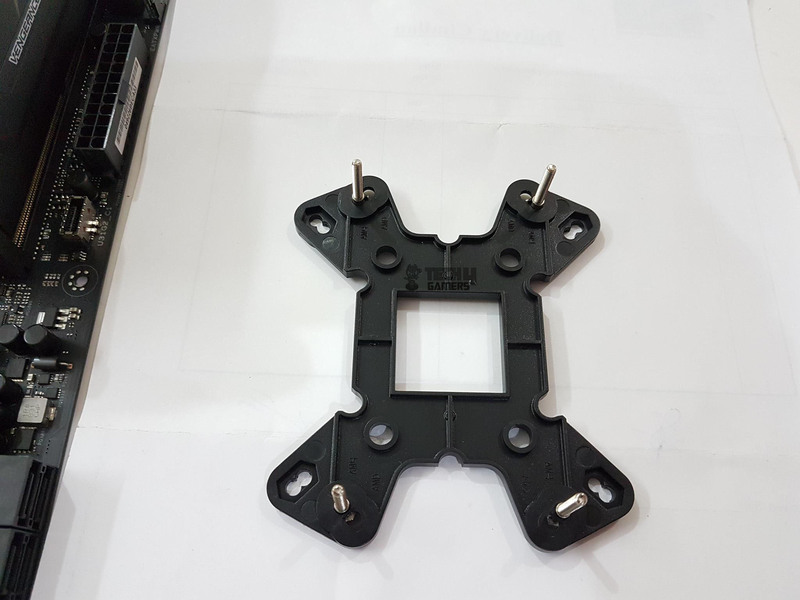 Place the block on the CPU by aligning the spring-loaded screws with the middle holes on the mounting bracket and screw tight the block on the CPU. Remove the AMD stock backplate from the motherboard. Slide the 4x bolt screws on the AMD backplate provided with the cooler. AM4 is clearly printed on the holes of the backplate. 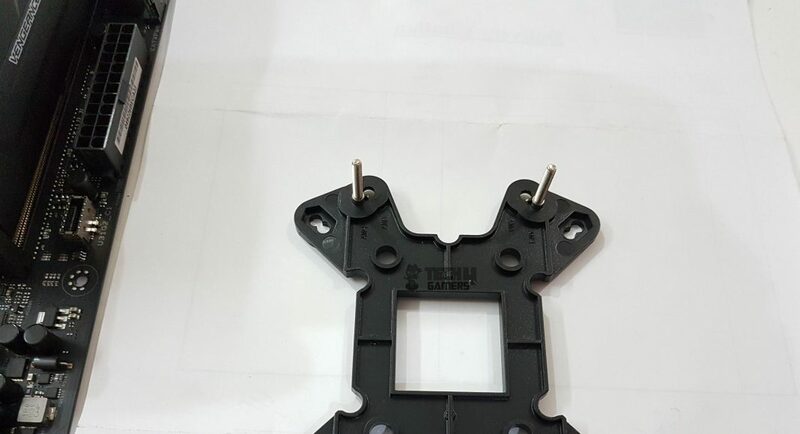 These bolts have hexagonal heads which should fit in fully inside the backplate. Place the backplate on the backside of the motherboard such that the screw bolts pass through the mounting holes. Place the Nuts B on the screw bolts and secure the AMD backplate. Make sure that black color side of the Nuts B faces the motherboard as it has silicon washers. Place the AMD mounting brackets on these screws. 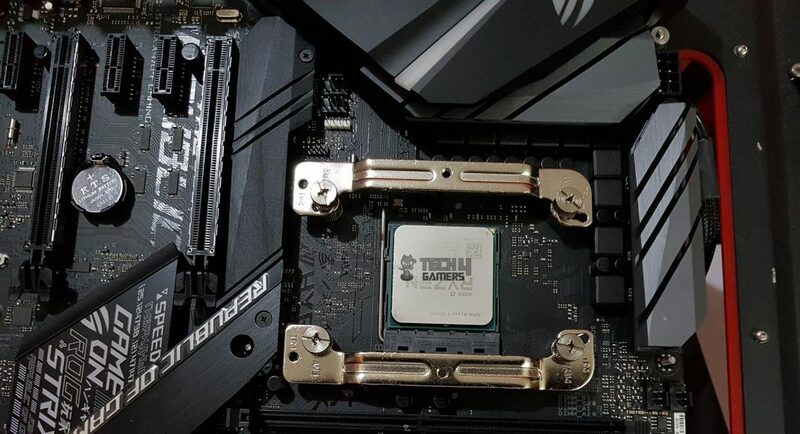 Secure the mounting brackets using the Nuts A.
Connect the 3-pin power cable of the pump to the CPU Fan header or the AIO/Water Pump header of the motherboard. Connect the fans’ power cables to the fan hub and connect the fan hub’s PWM cable to the 4-pin fan header of the motherboard. 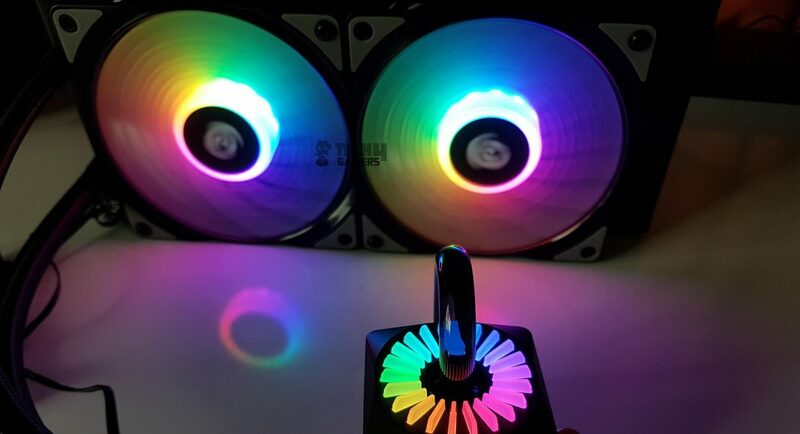 Connect the RGB LED cables of the fans and the block with the LED hub. Connect the LED hub to the source controller. The installation is complete. One observation that I made is that the side of the block where the hoses are located obstruct the block’s installation on the X99 as these hoses can’t be rotated fully and they were making contact with the RAMs. 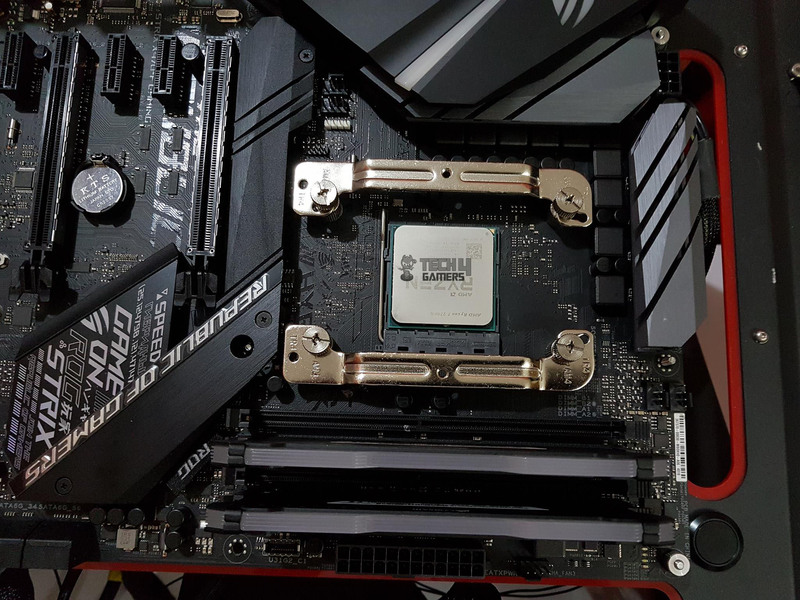 I take it there is only one way to install the block on the X99. 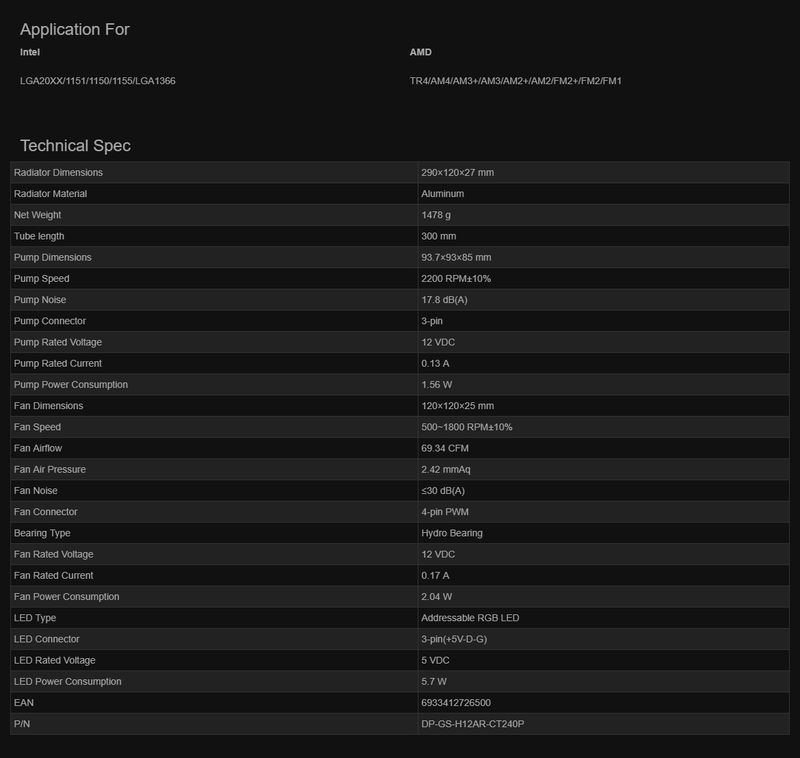 We are thankful to our sponsors of the AMD test bench. They are AMD, Corsair, Asus, and Antec. Following software were used for testing and monitoring. 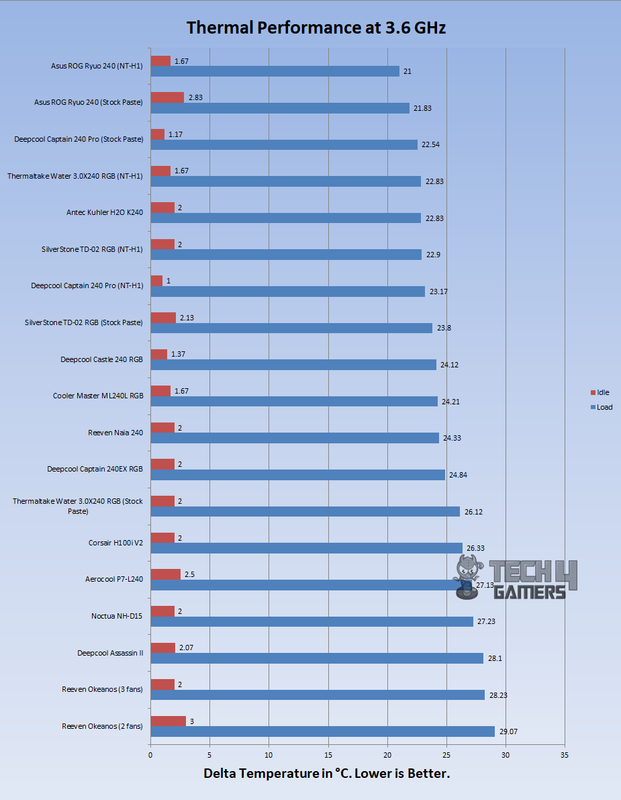 On the Intel platform, I have been using the Asus RealBench software to stress test the CPU. On AMD platform, RealBench was problematic hence; I resorted to AIDA64 Extreme for CPU stress testing. A run of minimum 30 minutes is made on each clock level and the average temperature is calculated by summing up the individual core’s temperature and dividing it by 6. The ambient temperature is deducted from this average value to yield delta temperature. This is on the Intel platform. 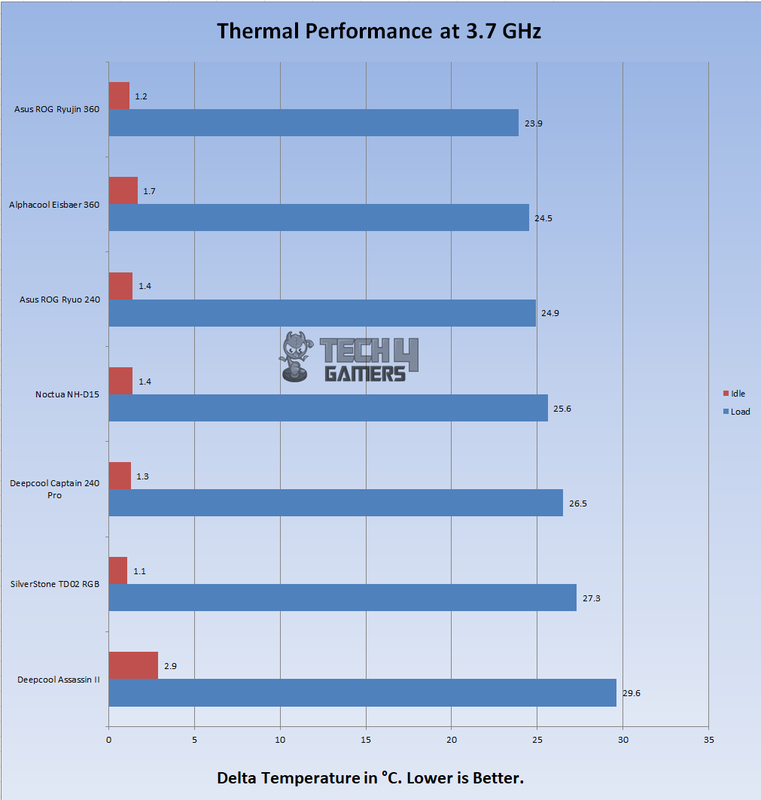 On AMD platform, tCtl was offset with -10°C as advised by the AMD for the 2700X only. AIDA64 Extreme run of minimum 30 minutes was made for each clock settings. Each run was followed by minimum 15 minutes of idling state. Delta temperature is calculated by subtracting the ambient temperature from the maximum reported temperature in the AIDA64 Extreme. Let’s take a look at the graphs. 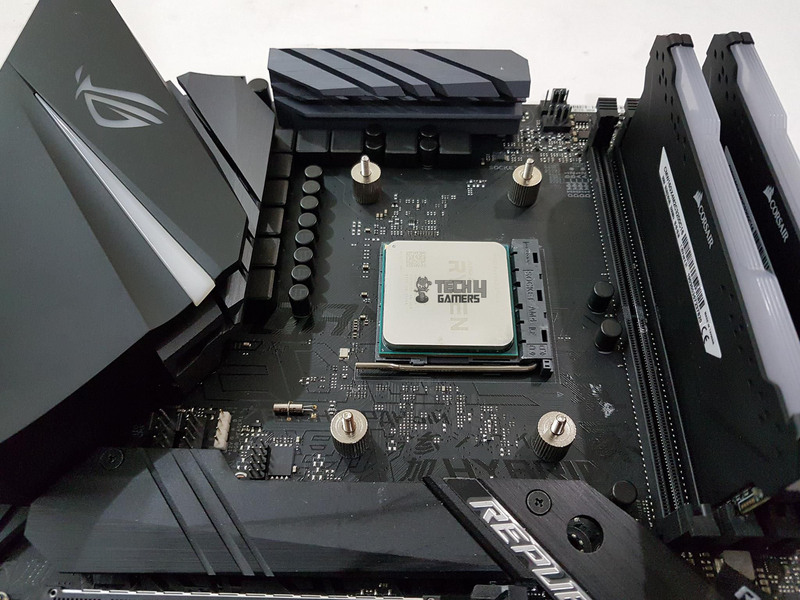 On stock clocks, the Deepcool Captain 240 Pro is rocking at the third slot though technically it is the second spot as the first two are with the Asus Ryuo CPU Cooler with stock and NT-H1 thermal pastes. 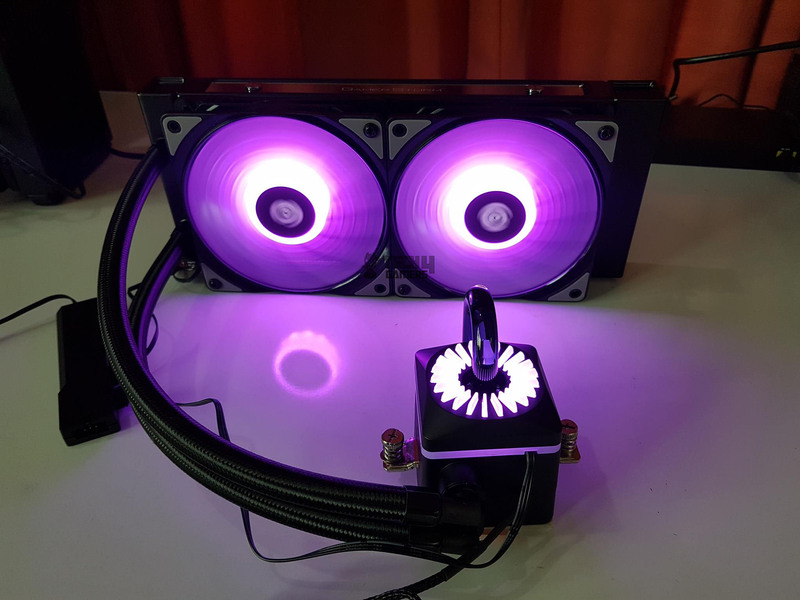 Deepcool clearly making a strong case here. 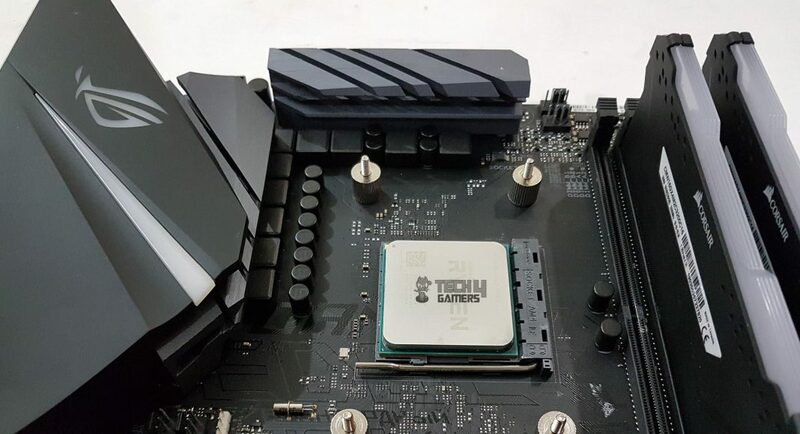 With overclocked 6850k to 4.3GHz at 1.350V, the Deepcool Captain 240 Pro has taken the sweet third spot again making its case stronger. It seems like Deepcool has used their premium thermal paste as well it is giving neck-to-neck competition to the Noctua NT-H1. The Deepcool Captain 240 Pro is sitting behind the Noctua NH-D15. The test was repeated three times to verify the readings both on the stock and the overclocked settings. 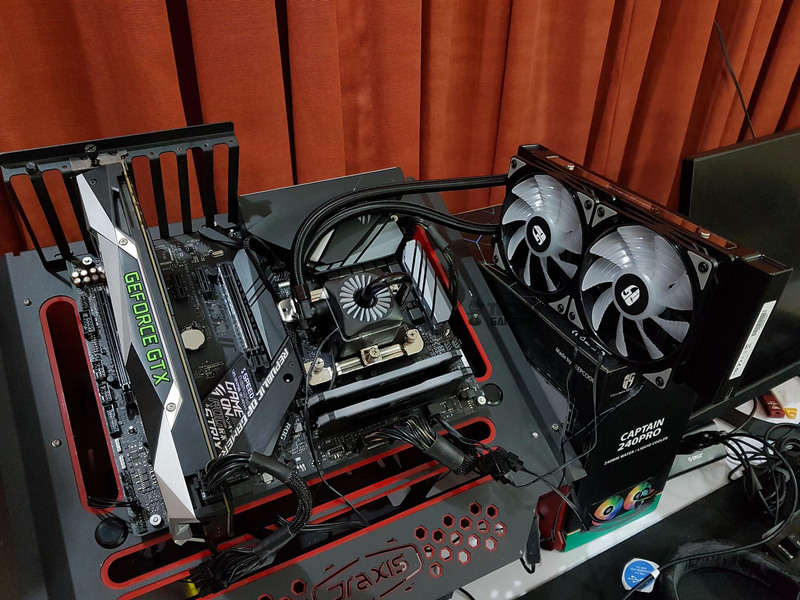 Again, we are seeing the Captain 240 Pro sitting behind the Noctua NH-D15. I could not measure the sound level of the unit due to un-controllable environmental noises. Based on my experience with the fans and coolers testing, the fans on the cooler are loud and the sound level seems to be in the 30s at full speed but they are not teasing. A custom fan curve can be helpful in case you are sitting too close to the PC or are a sound conscious person like me. 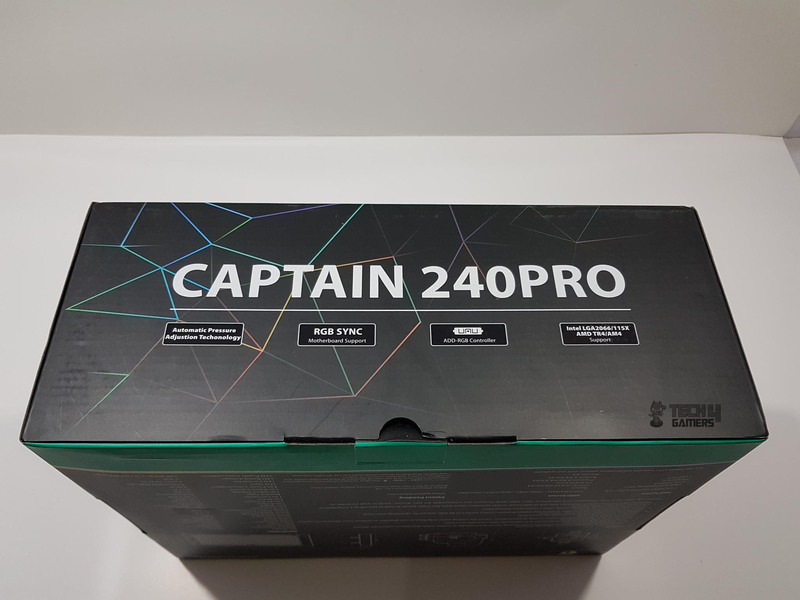 The Deepcool Captain 240 Pro is a 240mm CLC cooling solution. It has a 240mm radiator with two CF120 ARGB fans optimized for high static pressure and better air flow. The dimension of the radiator is 290 x 120 x 27mm. the length of the radiator has been increased to accommodate the automatic pressure release valve integrated right into the radiator. The thickness of the radiator is 27mm. With 25mm fans the overall thickness would be 52mm. The radiator is made of aluminum hence it is lightweight. 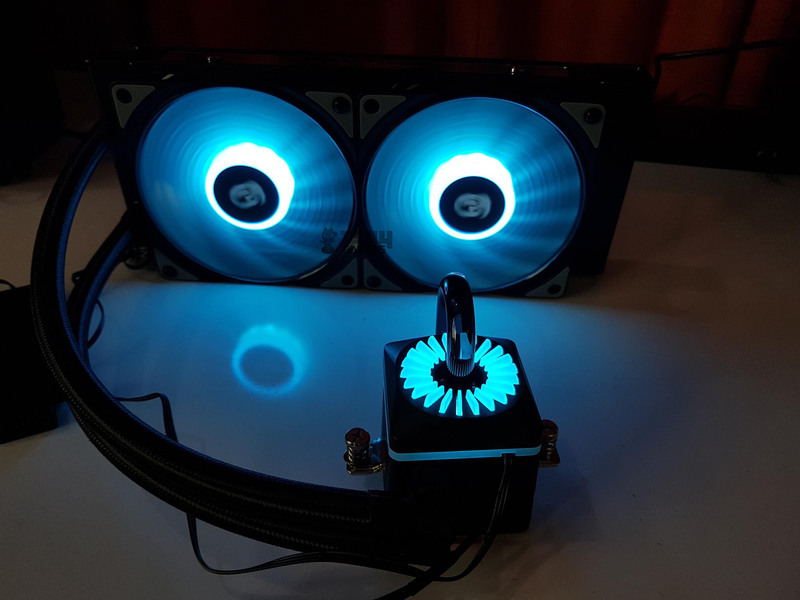 This is Deepcool’s own design. The radiator has 20 FPI. There is a gap of 105mm between any two fan mounting holes. The soft tubing is made from upgraded anti-explosion rubber tube manufactured using an anti-corrosion, crush resistant and thermostable material. The soft material tubing are bit flexible and don’t produce kinking which is always a plus. 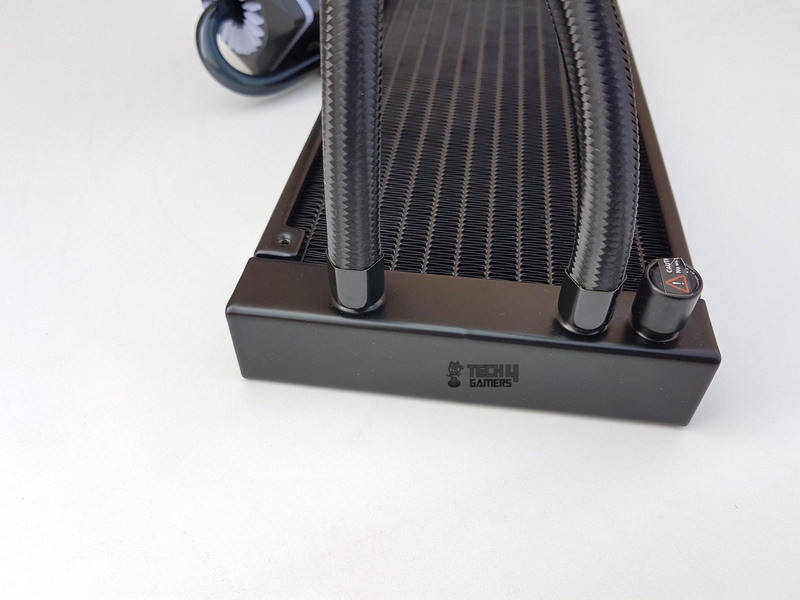 Deepcool is using mesh sleeve on the hoses to give them a clean look. One caveat is the length of the hoses which is 300mm. I was expecting a minimum of 320mm. There is a refill port on the radiator, which to my surprise has a warranty void sticker pasted on it. This cooler is compatible with Intel LGA-20XX/115x/775 sockets and AMD’s AM4/AMx/TR4 sockets. Modification in the block’s design to accommodate the ARGB lighting. 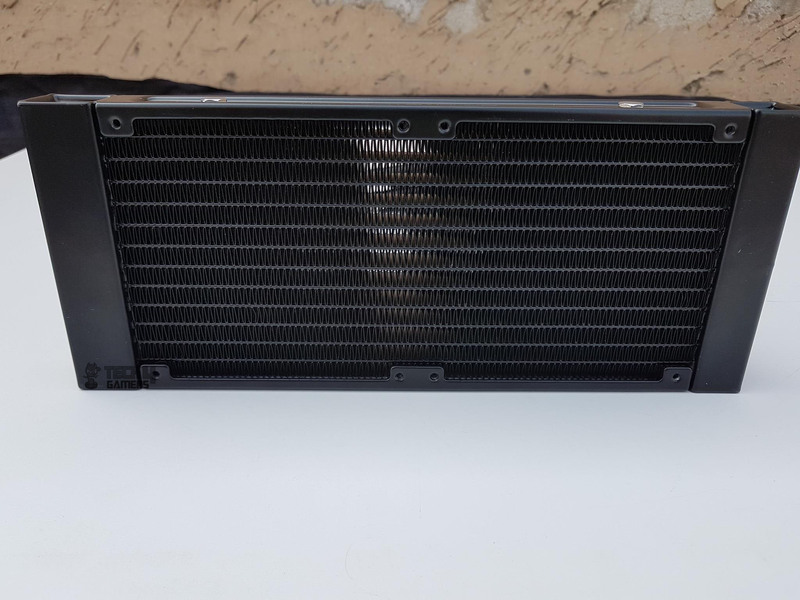 Sides of the radiator are finished with GamerStorm brand name printed on the plexiglass and secured using nickel screws. The key feature of this cooler is the new Anti-Leak system. 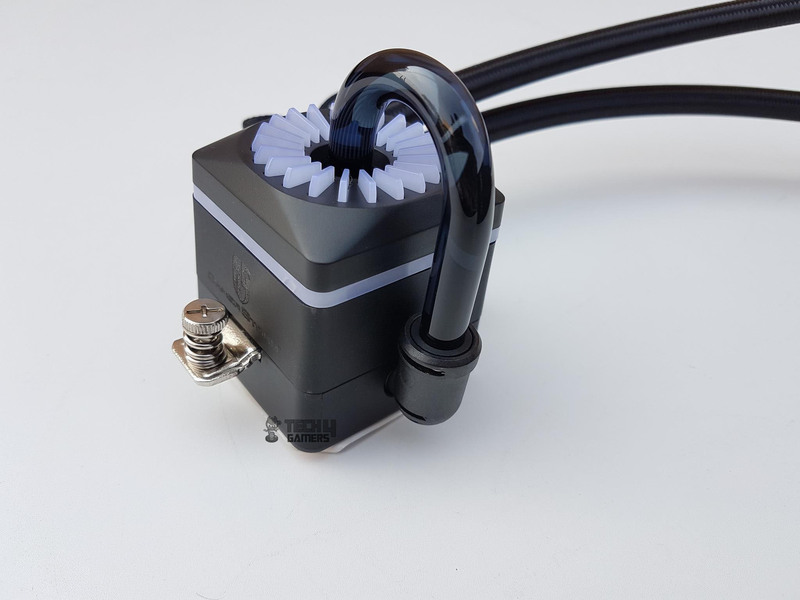 This is the first of its kind design in the AIOs that we have ever seen and Deepcool’s R&D department took 3 years in the design and testing to finally bring the solution of one of the biggest concerns/fears in the mind of the users when using the AIO; leakage. 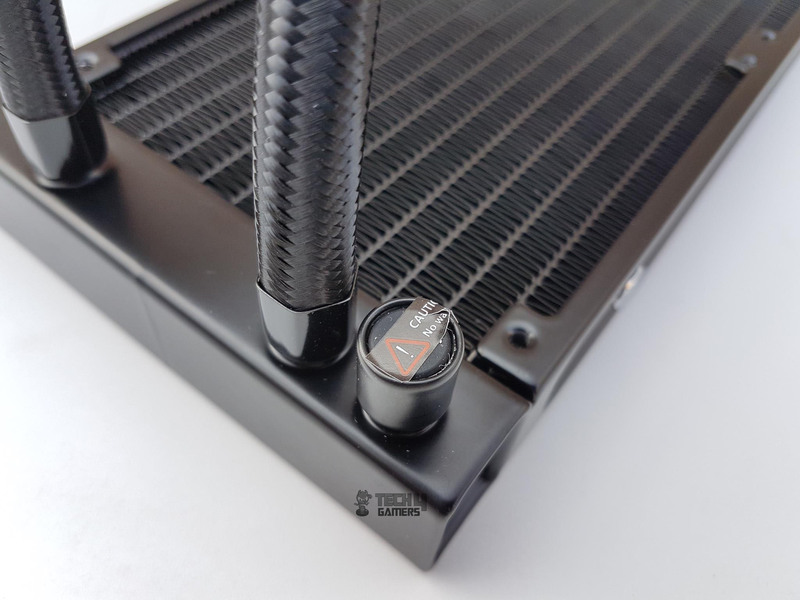 Using specially designed anti-pressure bag having properties of elastic in nature, resistant to the heat and corrosion and made out of premium EPDM material from DuPont, the DeepCool has integrated this bad inside the radiator on the outlet port. Its one end is dipped in the coolant whereas the other end is exposed to the air. Whenever the internal loop’s pressure buildup reaches and crosses the atmospheric pressure, the bag squeezes causing the increase in the volume of the loop which would release the buildup pressure in the air through the exposed end of the air-pressure bag. Definitely, a brilliant idea with equally good execution though only a long term testing could tell the tale. This cooler still retains the steampunk, arc reactor design which we saw on the Captain 240 Ex RGB with some modification. There is a glass pipe coming from the middle of the top side and going down the bottom chamber where the pump is located. This design approach has added more to the bold yet sublime looks and it is circumventing the Asetek patent on pump housing design. The RGB LED lighting is implemented on the top side of the block giving the dope look when the unit is powered on. The top section of the housing has a single piece diffuser which is running on the four sides of the housing. The top side of the diffuser protrudes the lid surface. Now we have 22 cutouts on the outer side whereas they were inside in the Captain 240 Ex RGB. The dimension of the block is 93.7x93x85mm. There are two cables coming out of the pump housing. One is the sleeved 3-pin power cable and the other one is the flat 3-pin RGB cable. The base is made of copper and is polished finish but not mirror like. The base measures the 53x53mm. The back side is where the hoses are implemented in 90-degree rotary position, protruding the block quite a bit. The hoses can be somewhat rotatable not fully. The Deepcool is using the closed impellers driven by three phase induction motor to deliver strong liquid flow. Deepcool is using Zirconia Ceramic bearings which are diamond-quality bearings which isolate the noise from the pump as well a longer lifetime. How much longer? Not mentioned in the specifications or the literature. Thanks to dual chamber design, the liquid flows in one direction to achieve circulation efficiency. Injection type microchannels for the water allows for maximum copper surface utilization for better heat conduction. 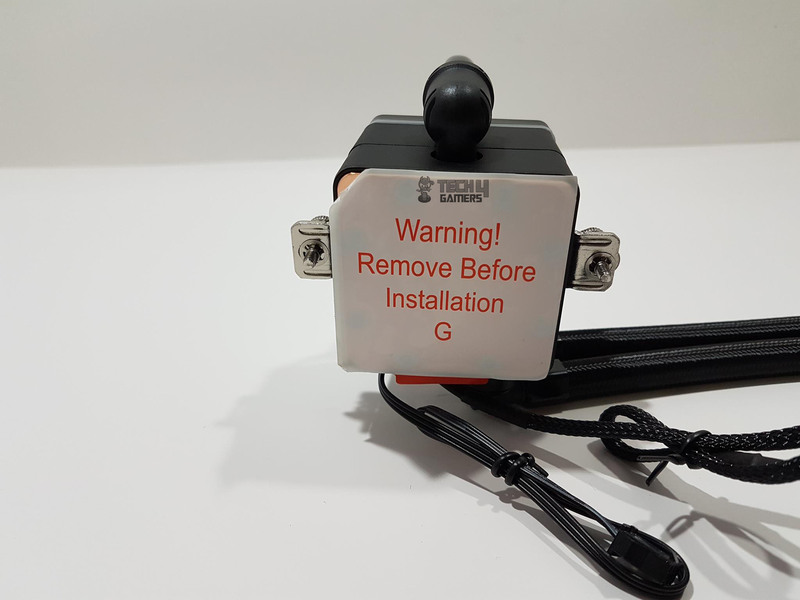 The Pump speed is rated at 2200±10% RPM at 17.3 dB(A) rated sound level using 12VDC at 0.13A rated current and 1.56W power consumption. 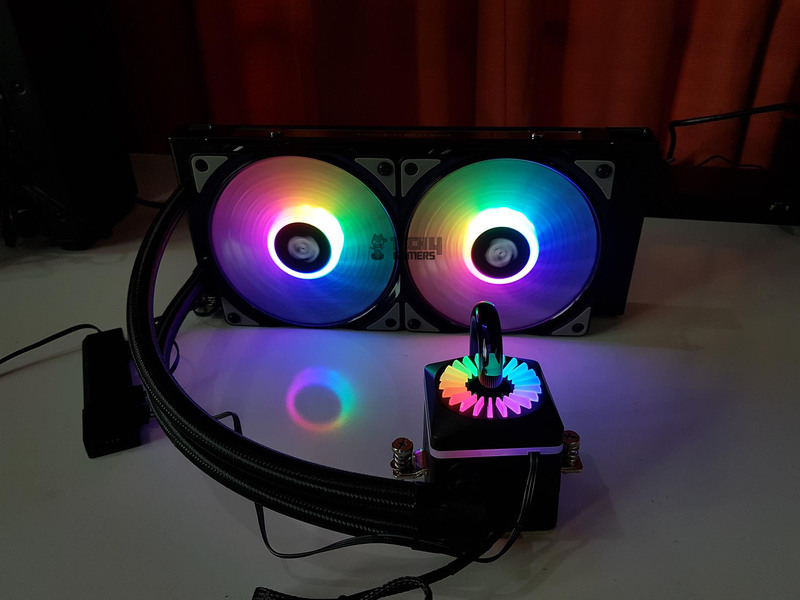 Deepcool has bundled two CF120 addressable RGB fans with this cooler. These are enhanced version of the original CF120s with specs tuned for better performance on the radiator as original CF120s are optimized for chassis airflow. 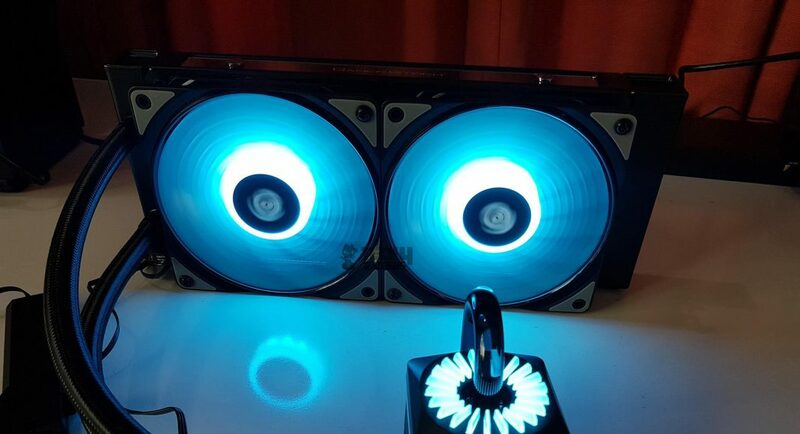 Each fan has 9 translucent blades with dedicated air channels on each blade. 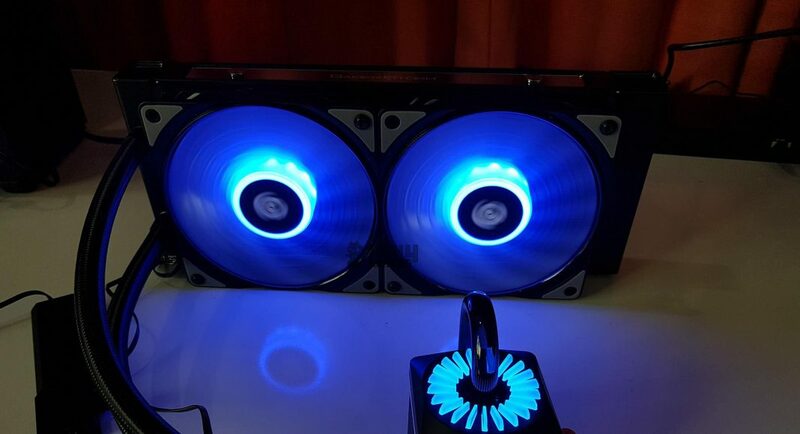 There is a GamerStorm brand logo sticker in the middle of the fans. Each fan has anti-vibration gray color pads on the mounting corners on both sides. The frame has a shiny black color frame on the upper side. Looking closely one can see the main design being circular around the blades and four mounting sides on this circle. The backside of the fans has an almost similar design as we saw on the TF120 fans that we reviewed earlier. There are air-forming channels on the edges of the frame. We have 4-arms assembly holding and securing the impellers to the frame. There is a black color sticker on the motor hub with GamerStorm brand logo and name on the top. Fans are made in China. 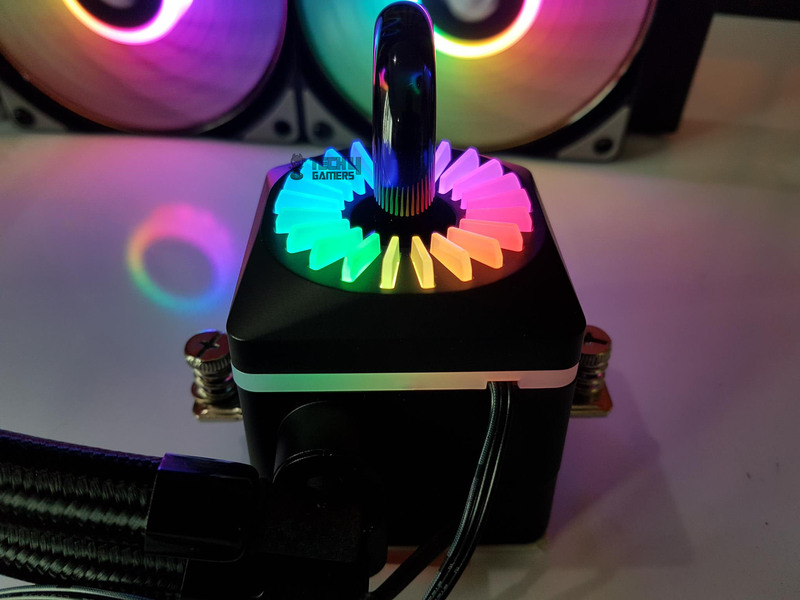 Each fan has 12 RGB LEDs inside the motor hub. These fans are rated at 12VDC with a rated current of 0.17±10%A with the power of 2.04W. The fan speed at 12VDC is 500±200 ~ 1800±10% RPM. Maximum airflow on 12VDC is 69.34CFM. The noise level is 17.8-30 dB(A). Maximum static pressure is 2.24mmH₂O. The fans are using the Hydro Bearings with MTBF of 40,000 hrs. There are two cables per fan. One is a 4-pin power cable with a length of approximately 280mm and it is flat. The second one is a 3-pin flat LED cable with a length of approximately 385mm. 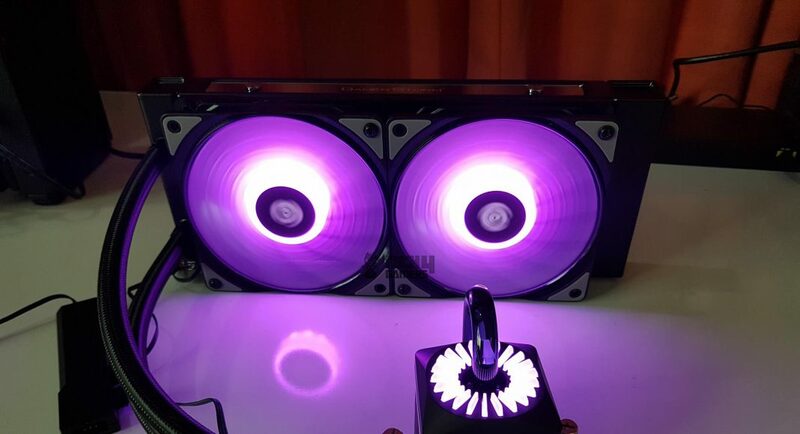 For more information on these fans, please check our detailed review here. We are not yet done with this cooler as there are many accessories worth mentioning here. 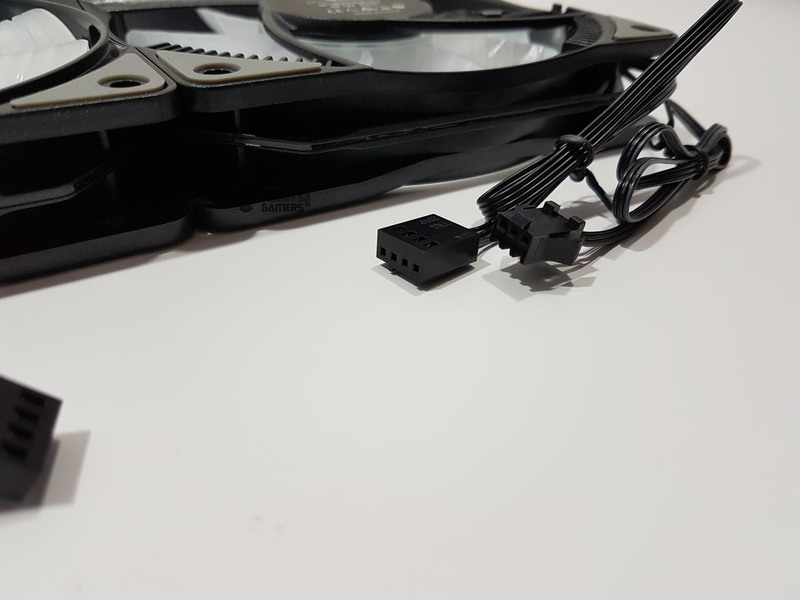 Deepcool has revamped its fan hub and has provided sleeker and slim designed 4-port fan hub. It has a 4-pin PWM cable. They have also provided a 4-pin PWM cable extension. The port 1 has a white color base indicating this port’s PWM signal will be used to set the speed of the remaining 3 fans. 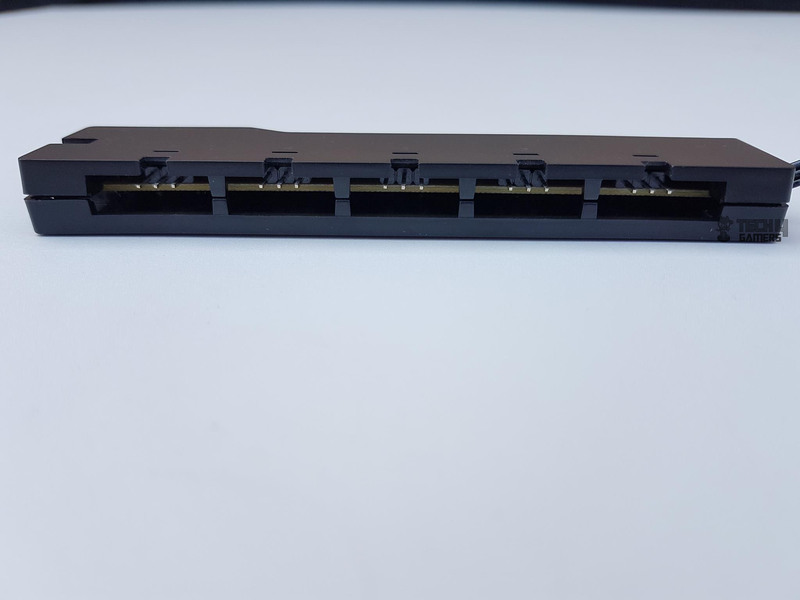 Instead of providing 3-way LED splitter cable, we have a beautifully designed 5-port LED hub to which we can connect up to 5 ARGB LED devices. 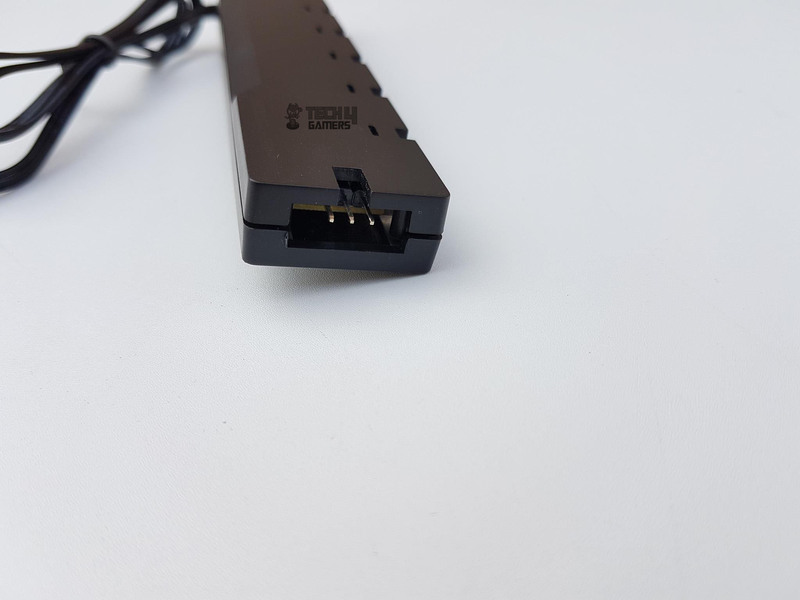 They have also provided two LED extension cables that would cover all the LED lighting solution found on the motherboards from various manufacturers. 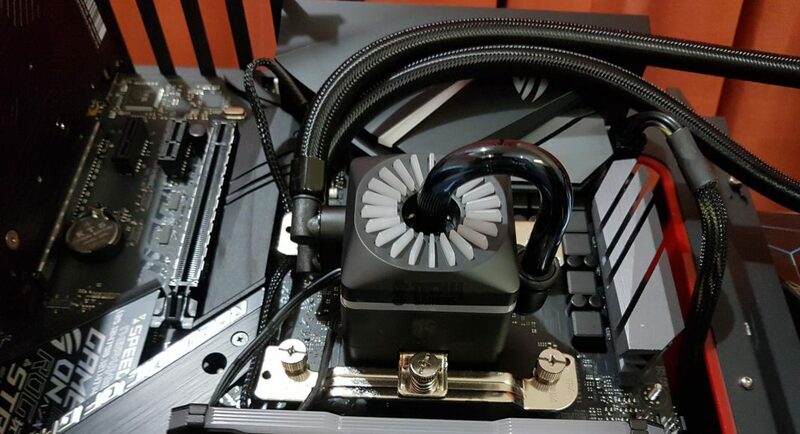 It is clear that Deepcool was on the task when it comes to paying attention to the details. 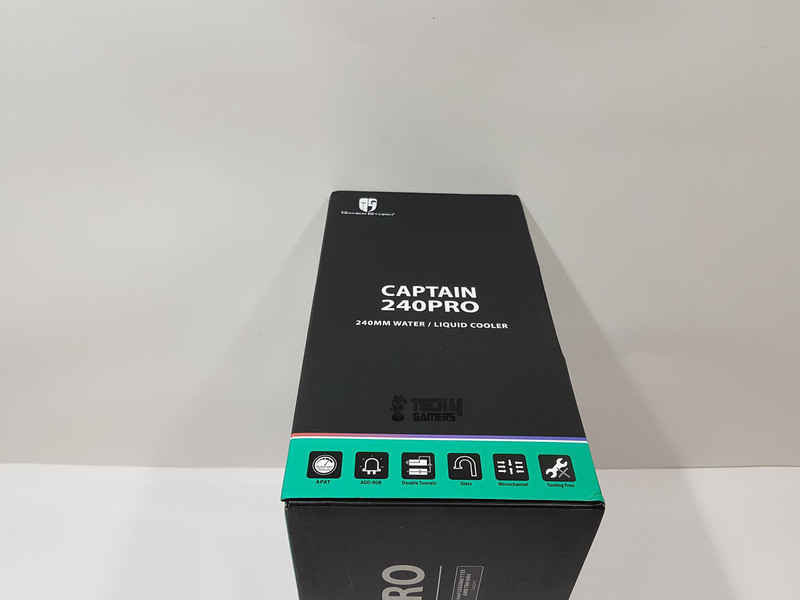 The Captain 240 Pro is listed at $139.99 at the time of the review. If it seems expensive, let’s recap what is bundled with the cooler. 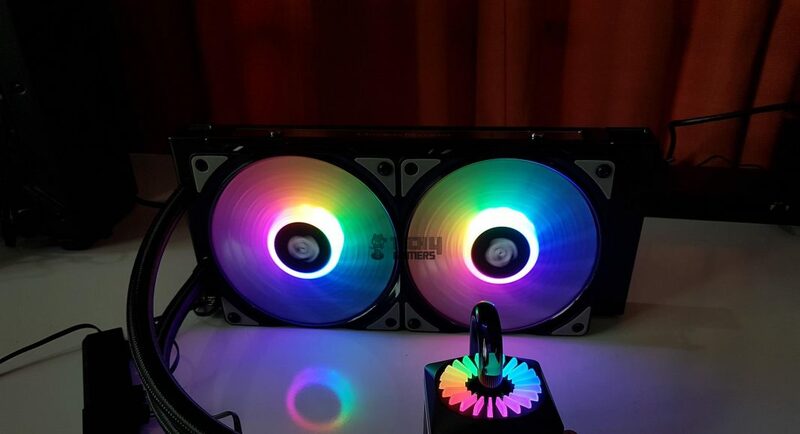 There are two high-performance CF120 fans which have digital LEDs, a dedicated RGB Controller, 5-port LED Hub, 4-port fan hub, PWM extension cable, 2x Extension cables to ensure the complete compatibility with the leading motherboard manufacturers’ onboard lighting solutions, AM4/TR4 compatibility and most above all the mechanism that has been integrated into the radiator to cope with the loops’ internal pressure buildup. Welp, you name it. They have taken care of everything possible that a user would like to do with this cooler. 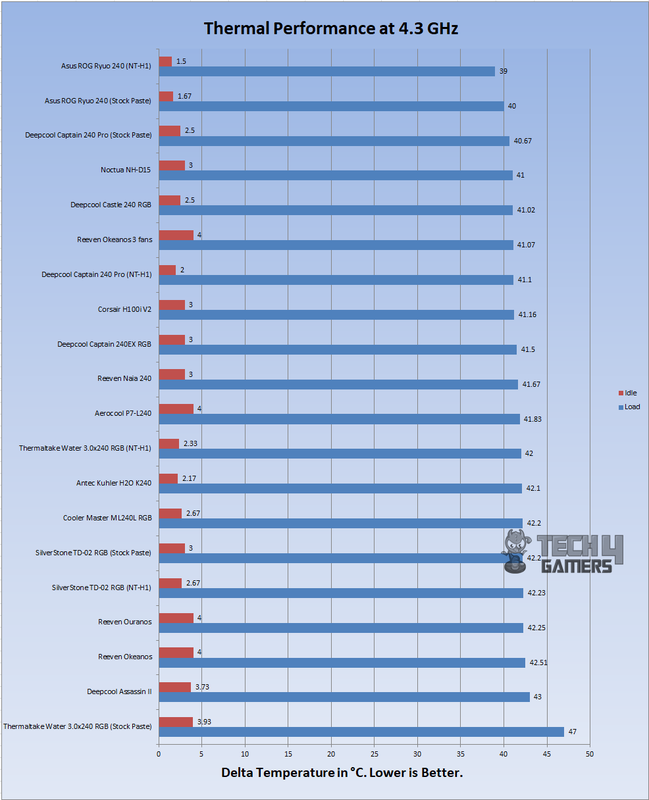 We have tested the cooler on the Intel and AMD platforms and it has performed very well. 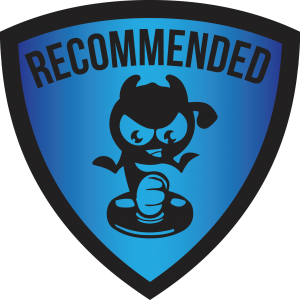 We are thankful to Deepcool for giving us the opportunity to review their Captain 240 Pro CPU Cooler. 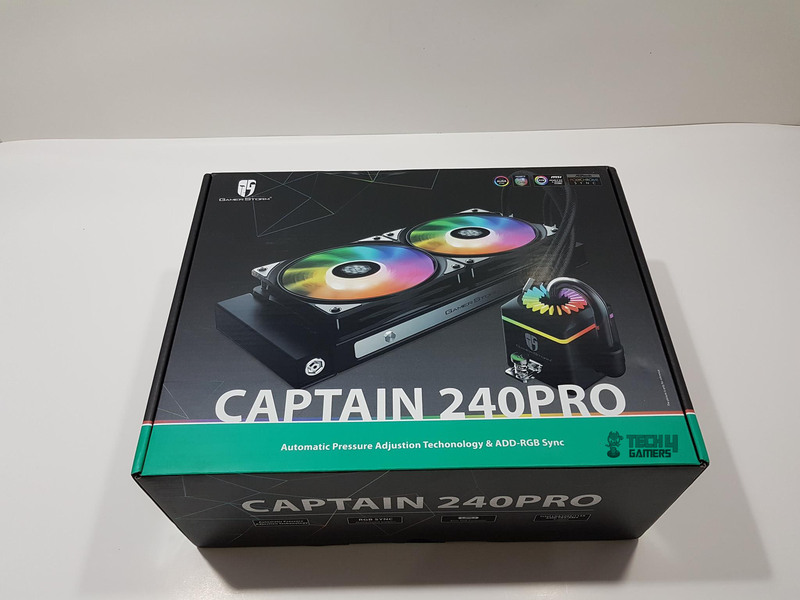 If you are into a market looking for an aesthetically pleasing looking cooler without a compromise on the performance and with utmost compatibility, look no further as Deepcool has yet again delivered a powerful punch with the Captain 240 Pro in almost every department. No wonder it has won our Performance award and comes recommended by us.